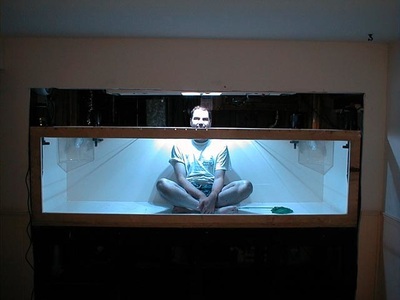 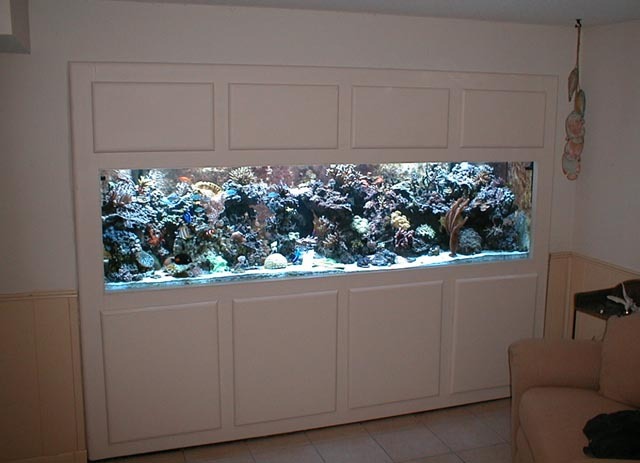 I had a 300+gallon ( 96L X 32W X 28H ) plywood tank I built myself inwall around 2003-2004. It used 5 X 400w MH 20K Radiums. 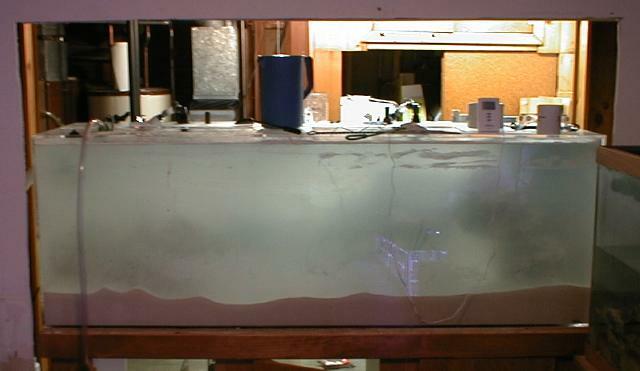 It was taken down becuase the amount of evaporation ( 6-8 gallons per day ) was just too high for our 1950s house with single pane windows. 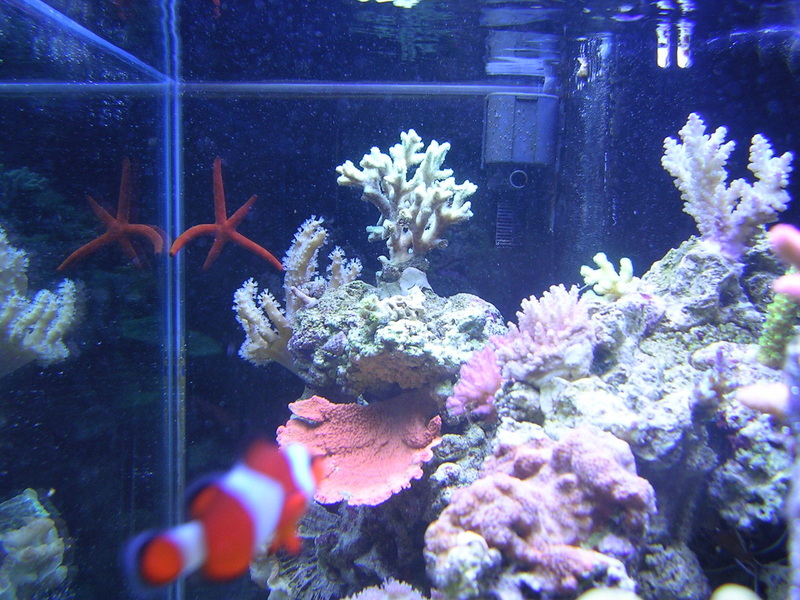 29g Tank is my sons room when he was younger ( 2006-2007). 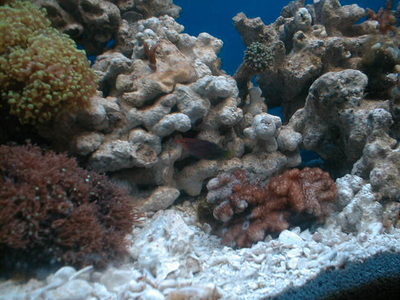 Petco stand with little chalk boards on it. 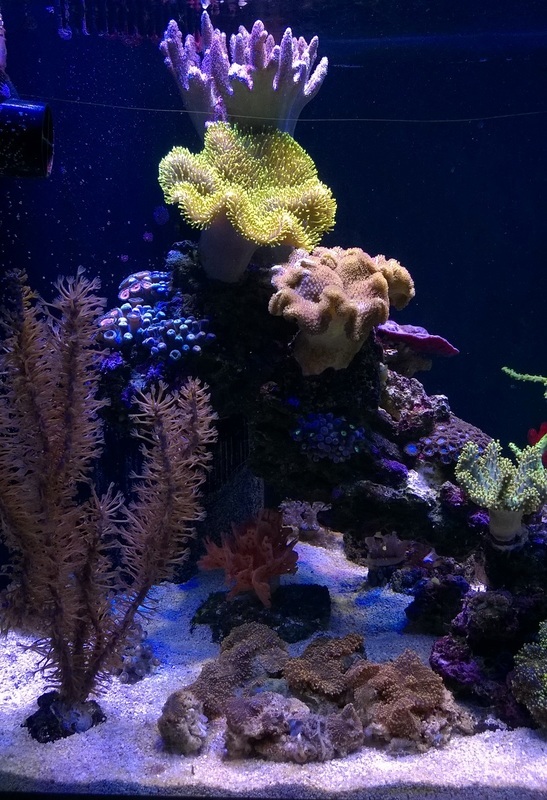 Simple setup. Little 10g sump with Tunze 9002 skimmer on it. 90g Tank ( 1999-2000) Back in when I had apartment in Maple Grove before purchasing our house. 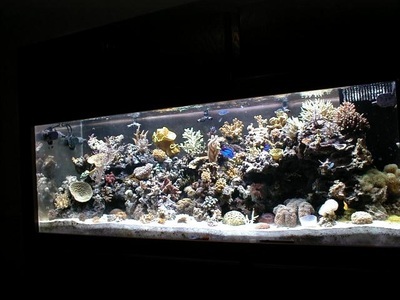 It used 2 X 175W 5700K bulbs and VHO actinics. ( There were not that many different spectrums to choose from back then in 175W ). 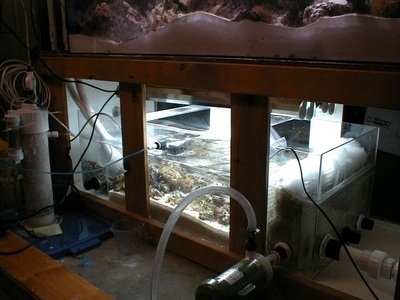 My original Calcium Reactor was a Knop-C and built a new one for this tank out of PVC. The yellow turbinaria in the gallery photos is the same one I still have today. About 17 years old. 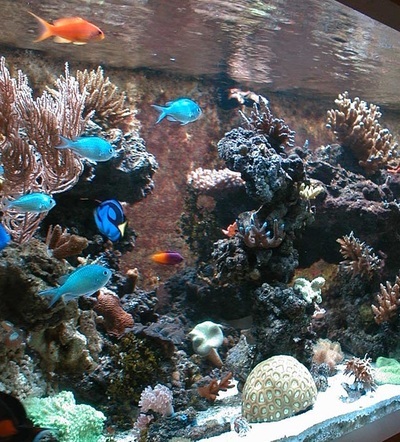 It came from Flying Fish Express which later became LiveAquaria. It was a 60" tank. 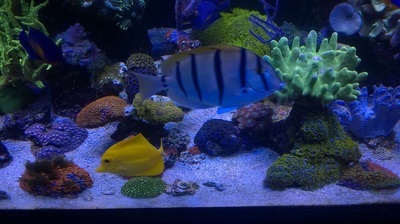 Had this tank for several years. The aquascaping in this tank is what turned into the current 180g tank. 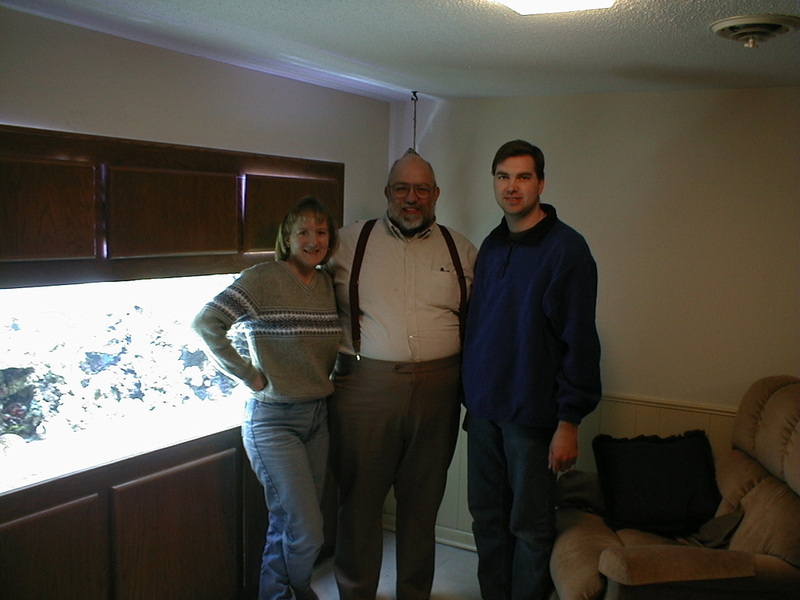 Right after moving into the house. 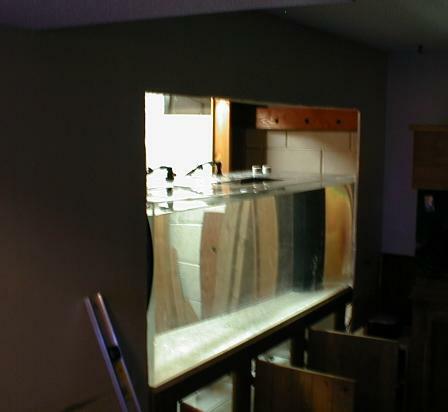 I built In-wall tank in the basement. 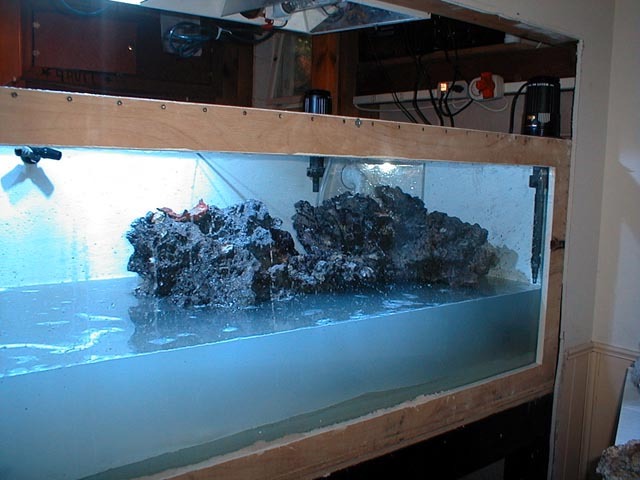 Ran 3X400w MH with 10K Ushios and VHO actinics on it. 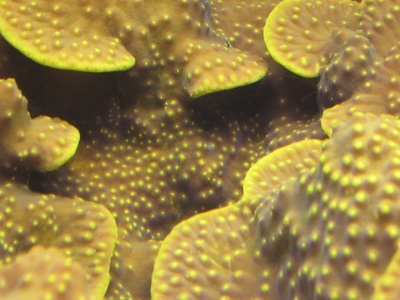 Many of the SPS had redbugs on them. 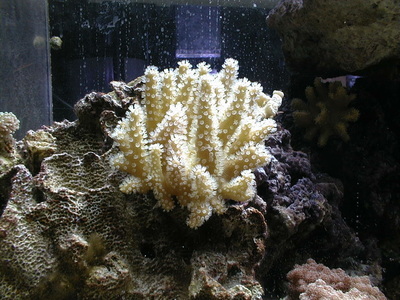 Back then not much was known about them and there was no good way to irradicate. Dipped in Lugols would slow it down some but that's it. 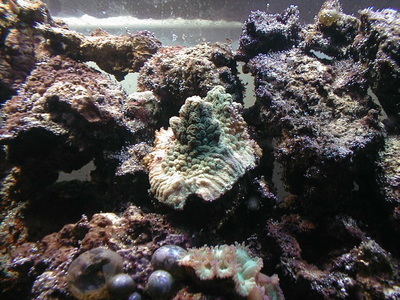 I ran skimmerless with large refugium for about 18months on this tank but there was a large amount of calerpa in the back that went asexual. Tank didn't crash but did a mad scrable to get a good skimmer. 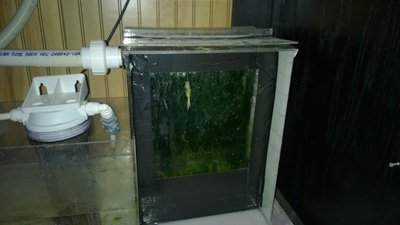 Went with a beckett style injected skimmer from Geo back when just getting started in arcylic building. 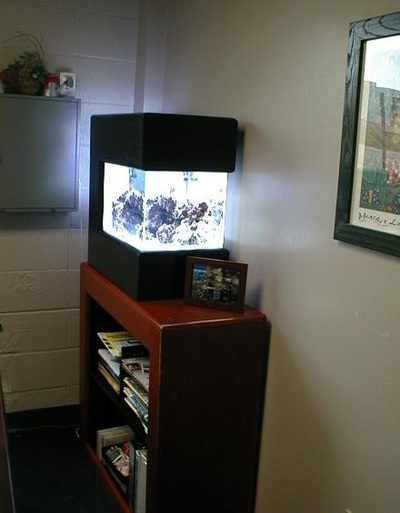 A little 10g Tank Christy had set up in her office at Church. 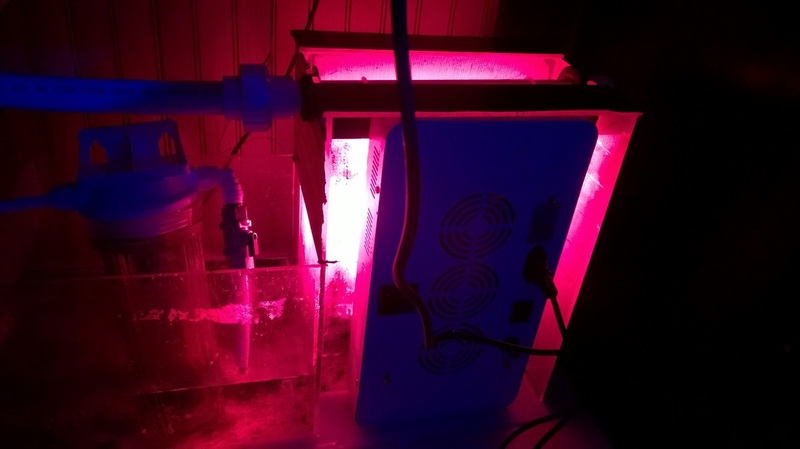 It used a couple of 28W PC bulbs on it. 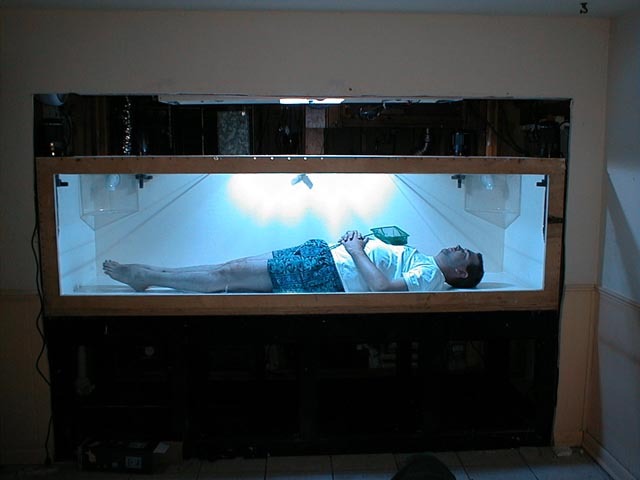 It had auto topoff but no other automation. Sump was just a portion of the tank partitions off on the side. It was such a success we setup a larger tank in the Church Lobby. Demensions is exactly 1/2 of a 75g. 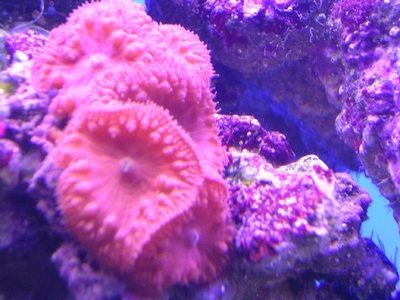 Pretty unique back in the day. 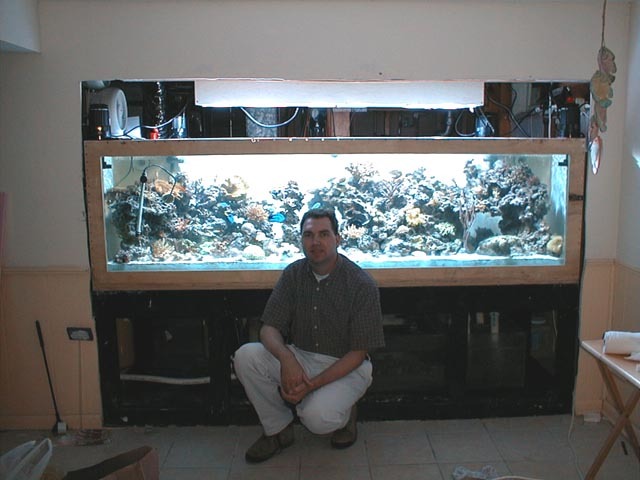 Long before all these cube tank sizes were available. 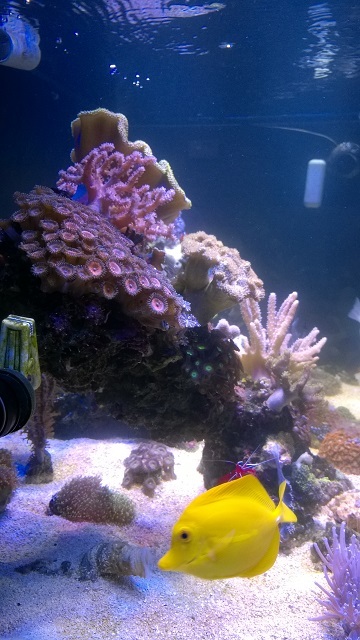 First tank to try 150W Single ended MH on. 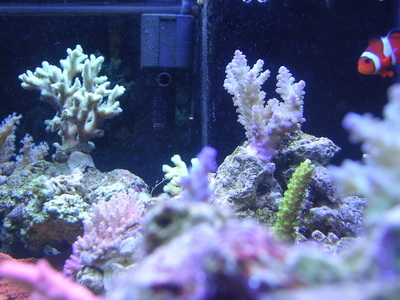 It was an Iwasaki bulb but can't remember the spectrum ( it was higher than 6500K ). 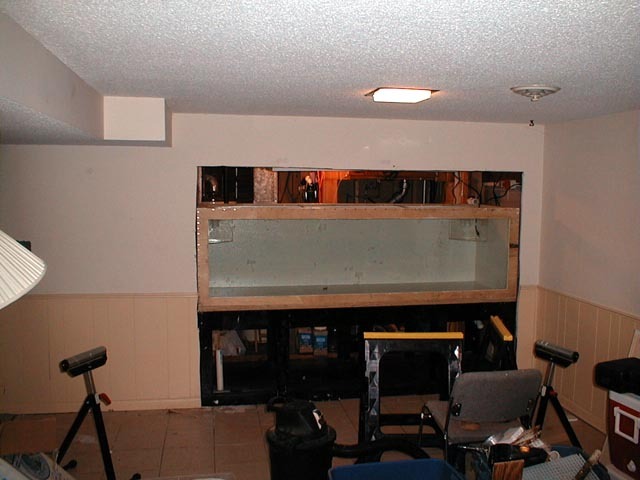 Corner overflow area was the sump. 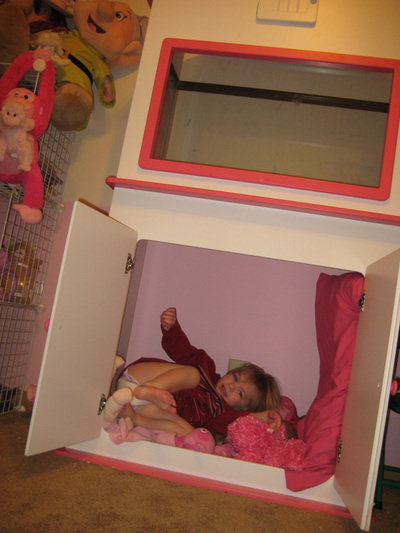 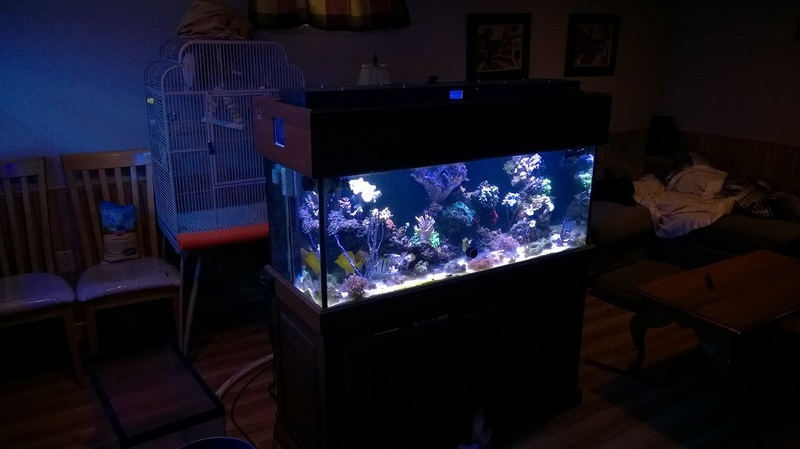 It housed the heater and auto topoff. No aquacontroller just a temp controller to control the heat and the fans. 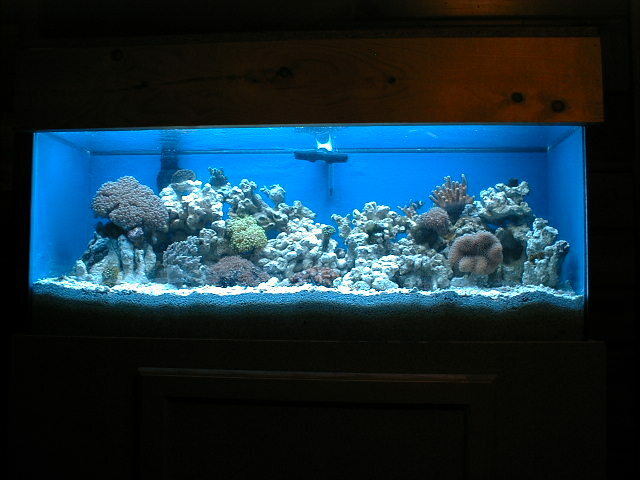 I set this tank up for Christy in her apartment before we got married. 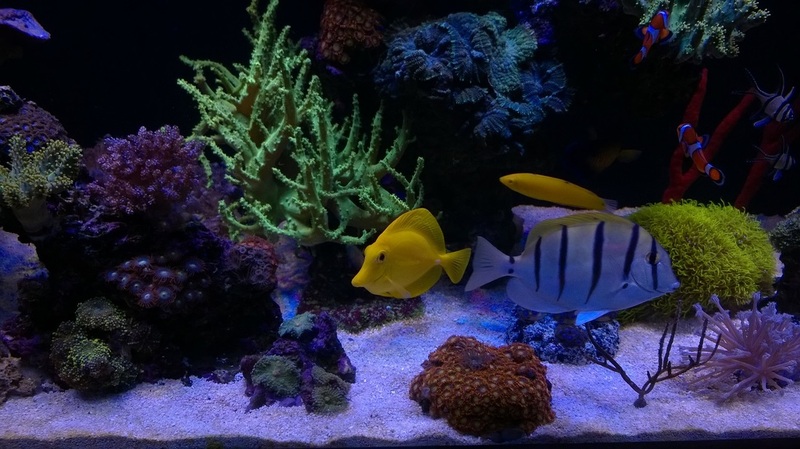 First tank to try out PC lighting. They were the 96W ones, no actinics available just blue and daylight options. 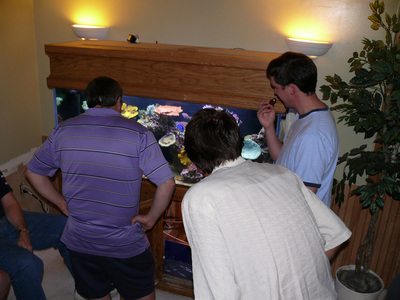 When first came out , people were convinced it was going to be better than MH. 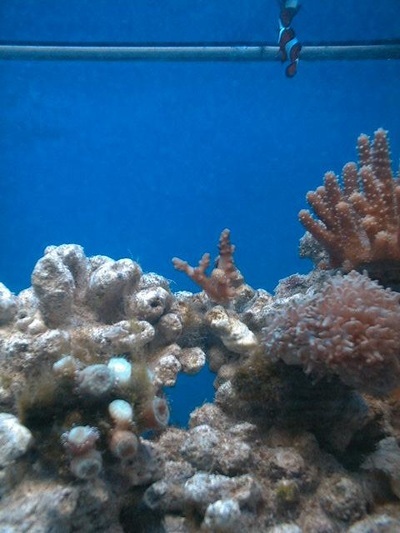 Far from the truth. 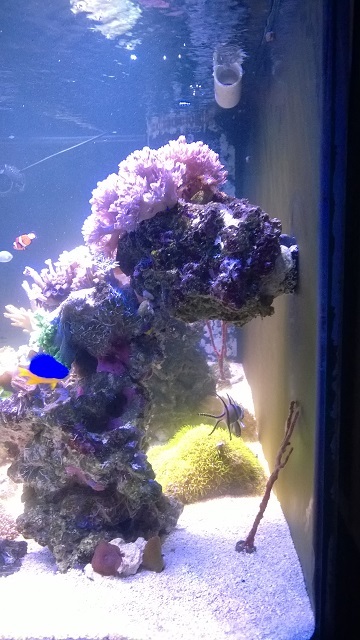 I broke the very first bulb trying to get it on, there was a weak spot near the ends with just small amount of glass between the two tubes, I was dissapointed never ran PC bulbs on a tank again except real small 10g tank becuase VHOs were too long. 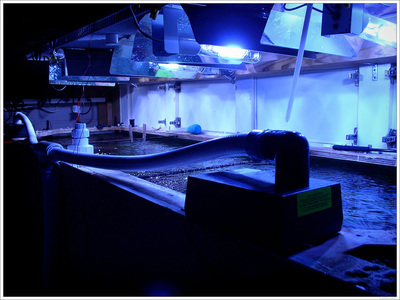 Unfortunately these are the only pics I can find of 90g tank when I lived in VA. 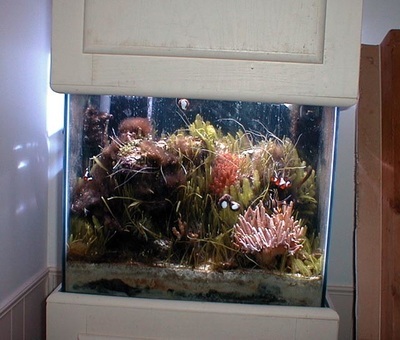 Tank was not in the best condition when these pics were taken. I believe the only reason I have these pics is becuase I was testing out my first digital camera that I paid $900 for. 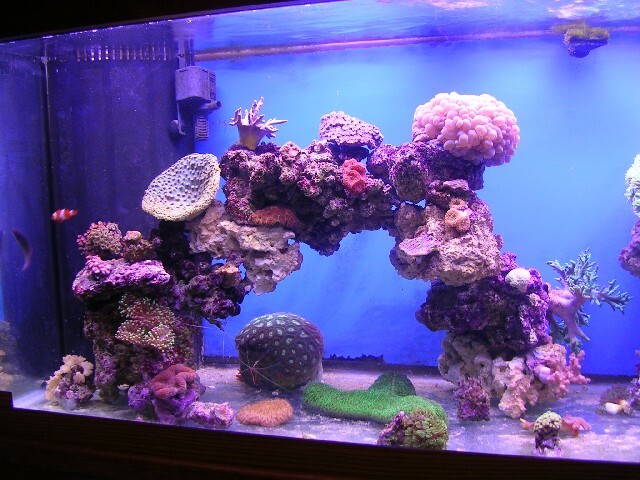 This is the first tank that I learned how to run Calcium Reactor on. 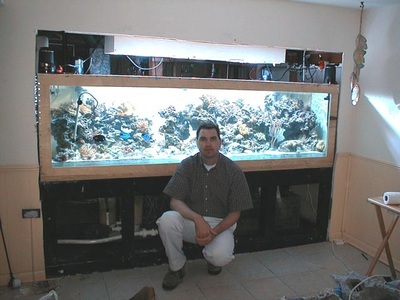 ​It's the same 90g tank I have in 1999 apartment in MN. 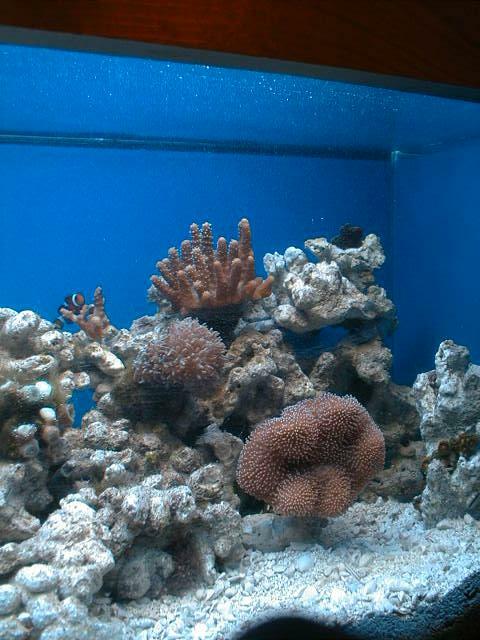 However the tank move did not go well and lost all livestock during the move to MN. 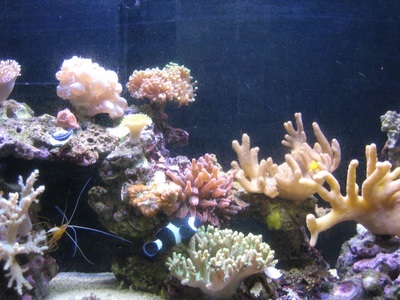 I cannot find any pics of my very first tank which was a 45g corner tank. 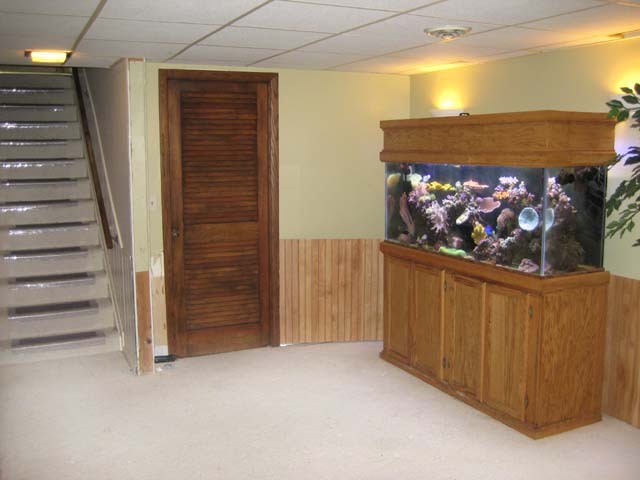 It was located just after the stairs and was always in the way when bring furniture down the stairs. 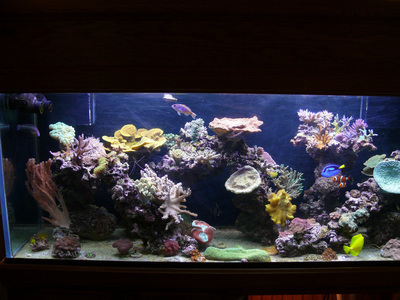 This is why the current 29g tank is in-wall. I liked the location but not blocking the stairs. 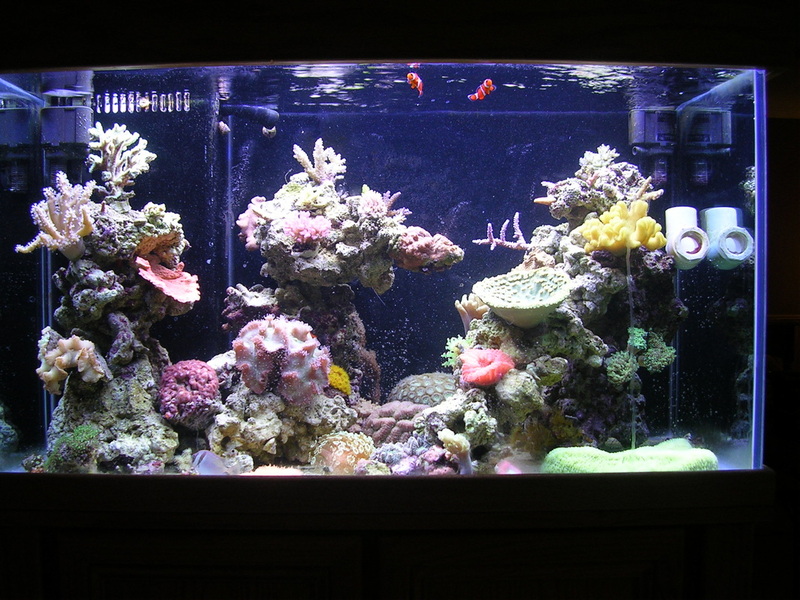 First Tank I ever used T5s. Choices were very limited. 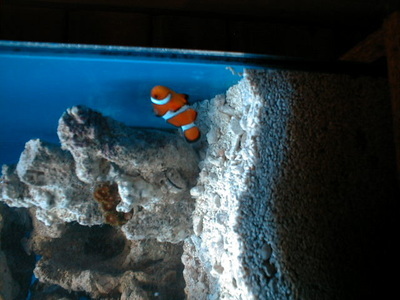 There were blue T5s. 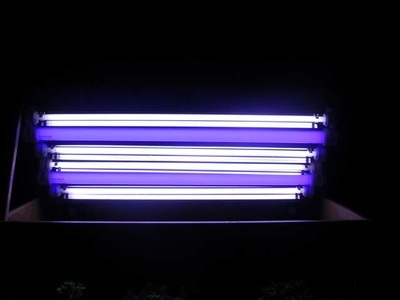 The only daylight bulbs were the 6000K GE bulbs. 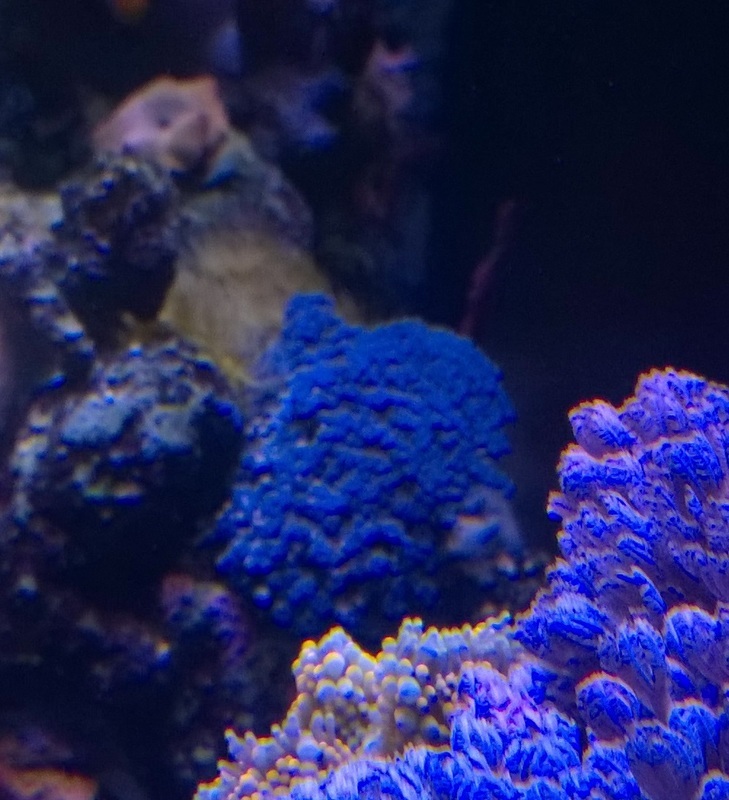 There were no T5 actinics yet so I switched out the Blue T5s for VHOs for the actinics. This is the only pic I can find of the 125g tank that I moved the items I was going to keep from the 320g tank when I tore it down. 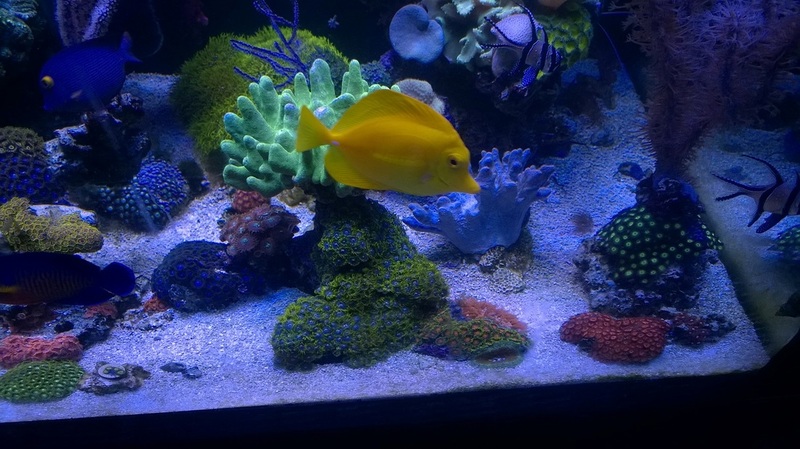 The tank was very short lived. 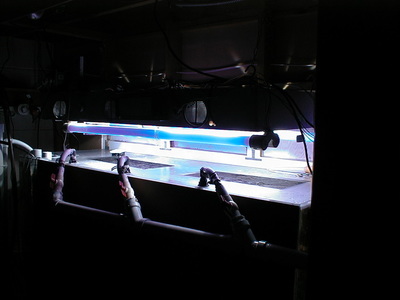 Lighting was an Aquamedic 3X 150W HQIs fixture. This tank had a plastic brace right in the center which blocked the center MH. 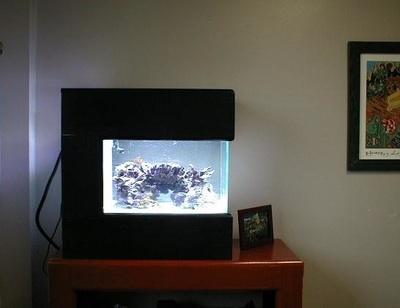 I cut it out and replaced with clear acrylic. It helped but you can still see the shadow of the brace on the back wall. 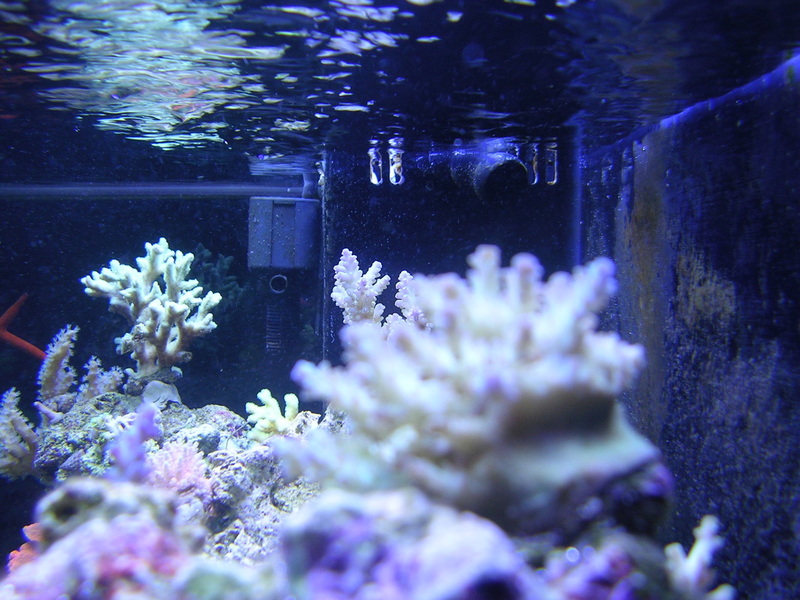 It's also the only tank I ever ran a chiller on. Not becuase it really needed a chiller I just wanted to try it. 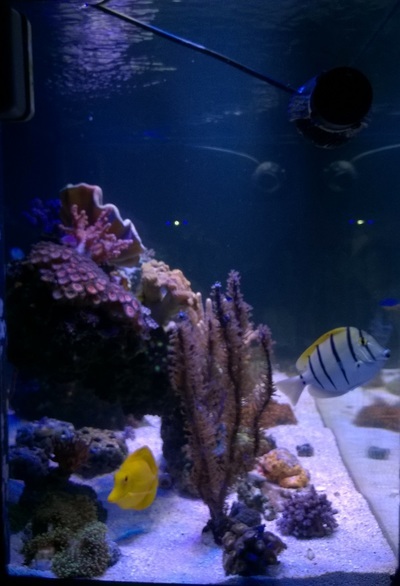 This tank was lit by VHOs on Icecap Ballast. 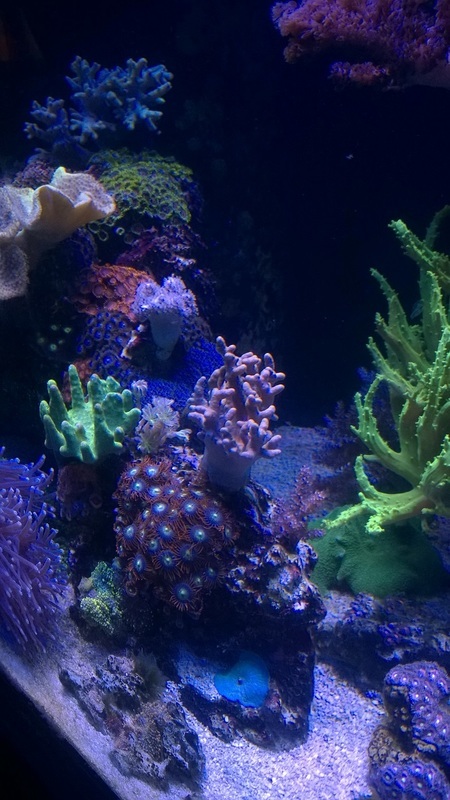 At this time, I tried to stay away from acros. 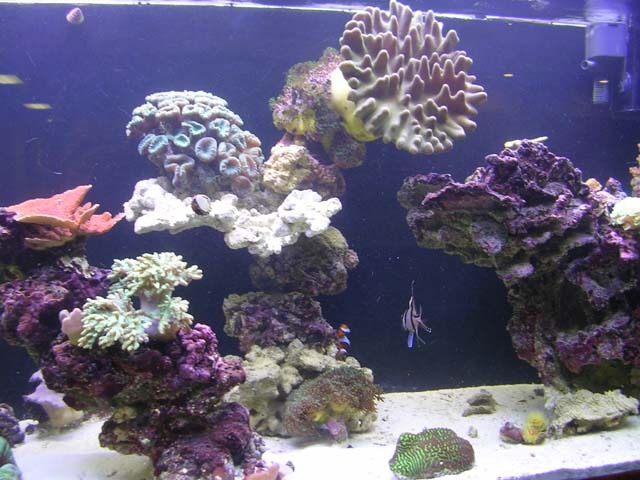 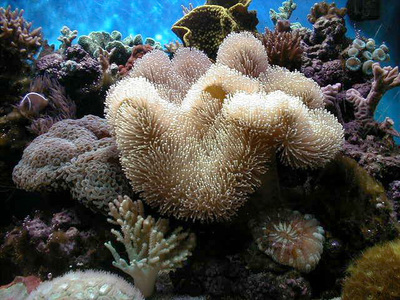 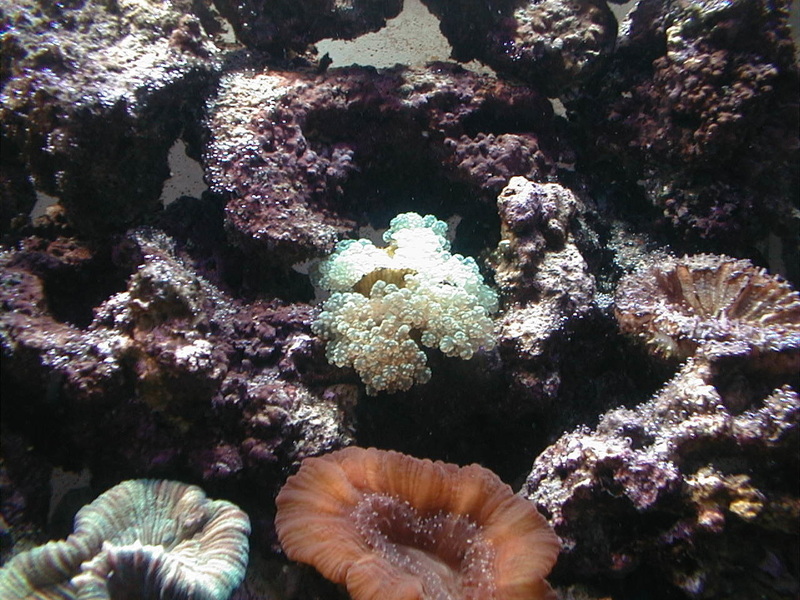 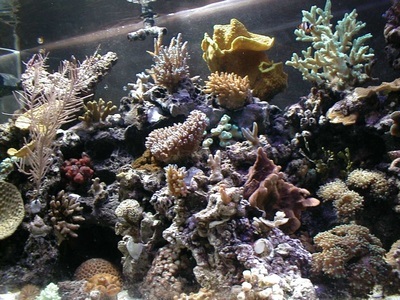 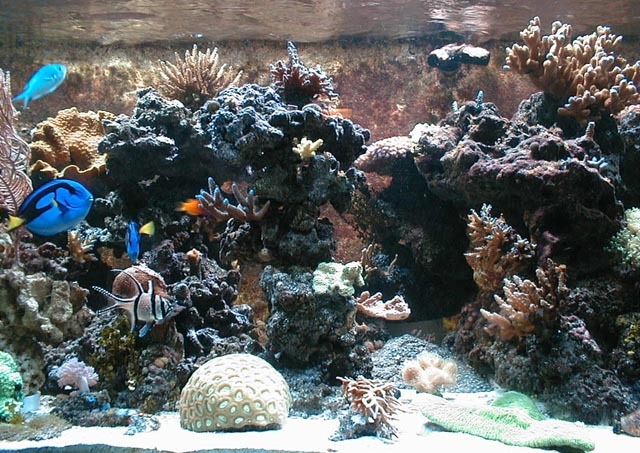 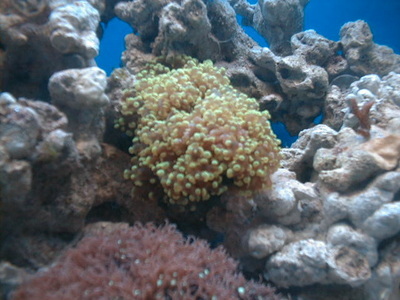 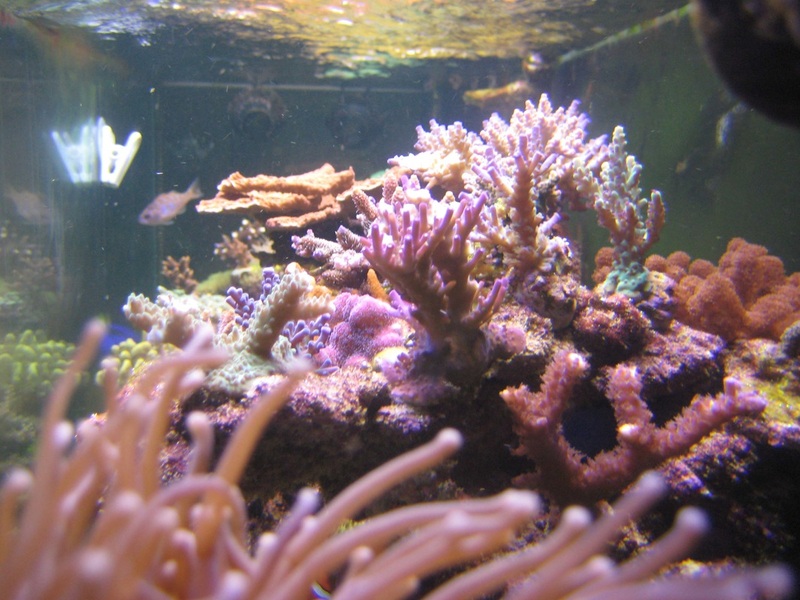 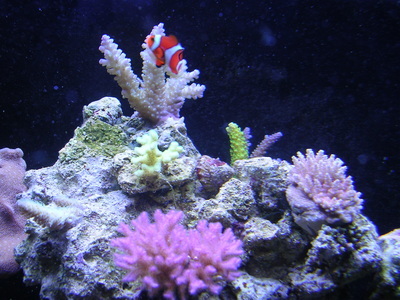 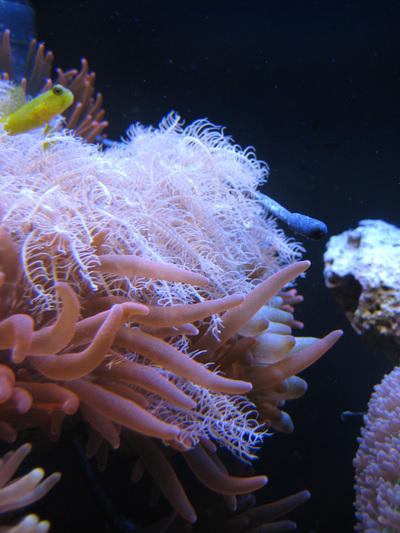 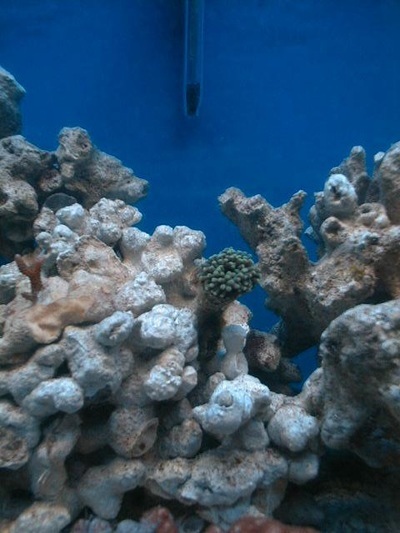 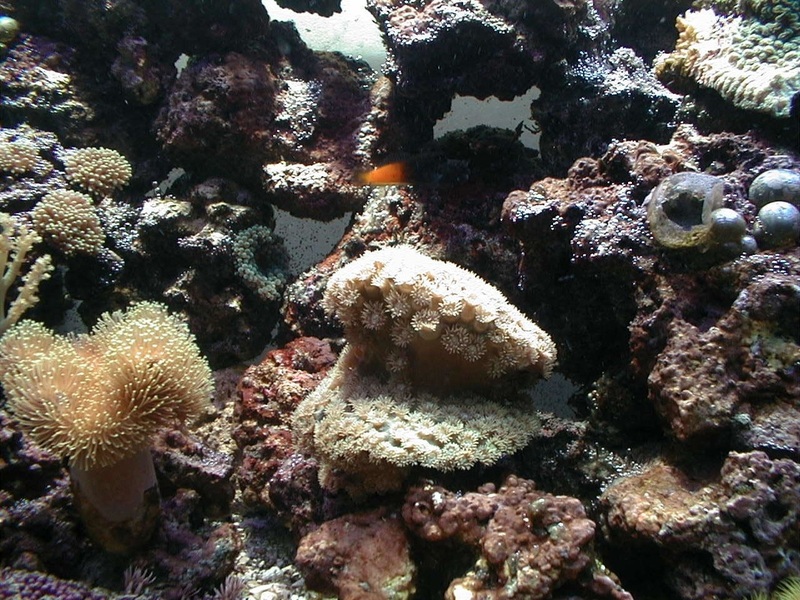 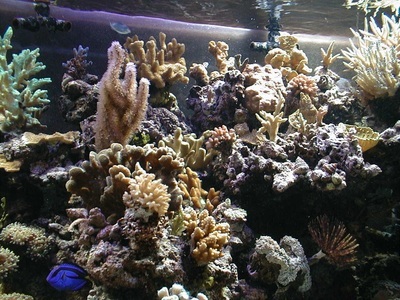 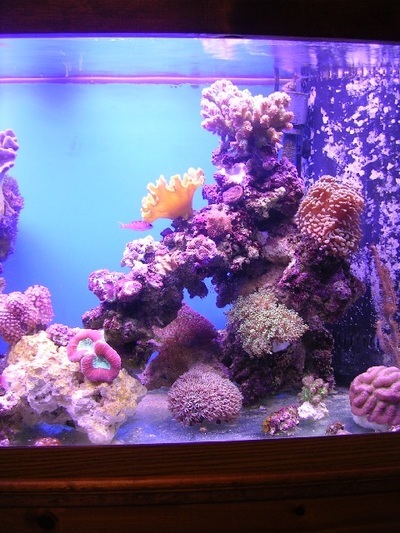 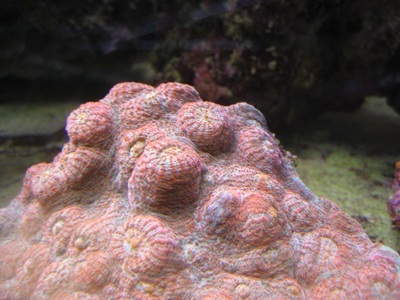 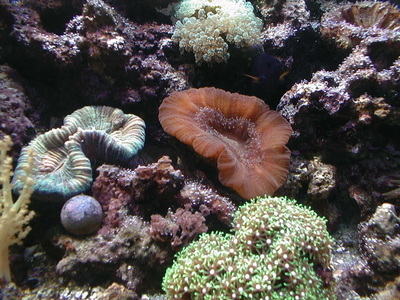 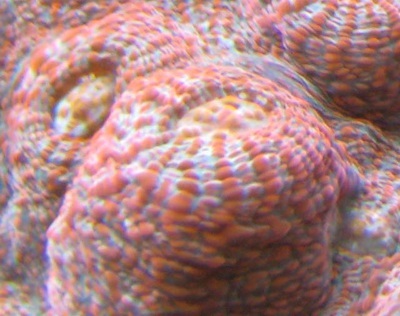 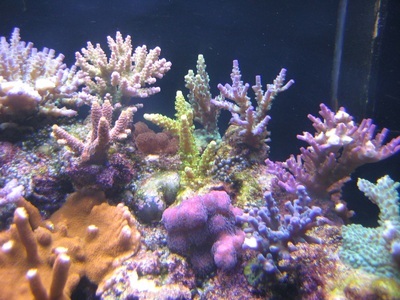 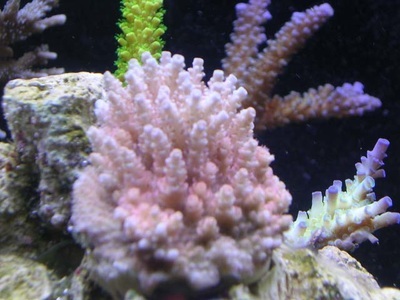 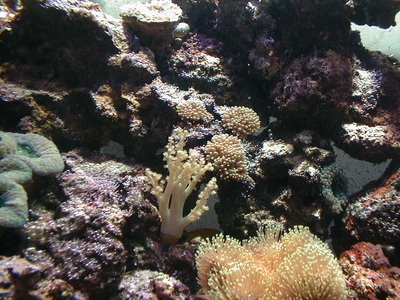 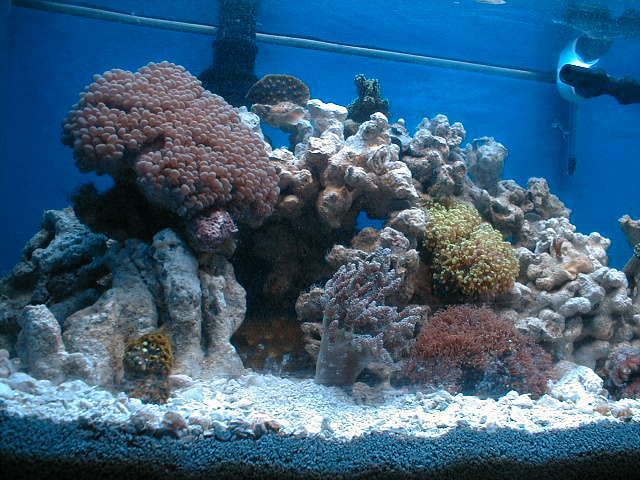 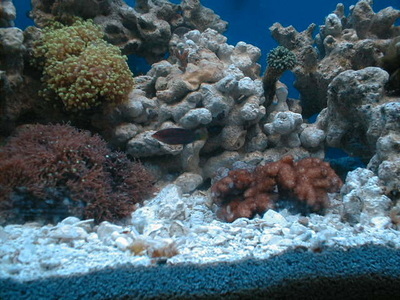 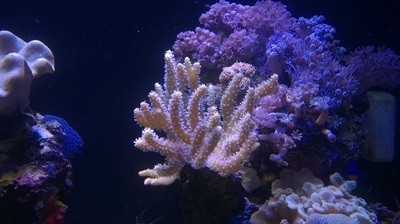 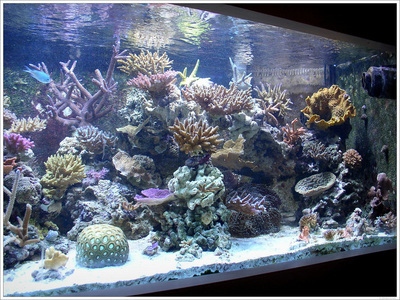 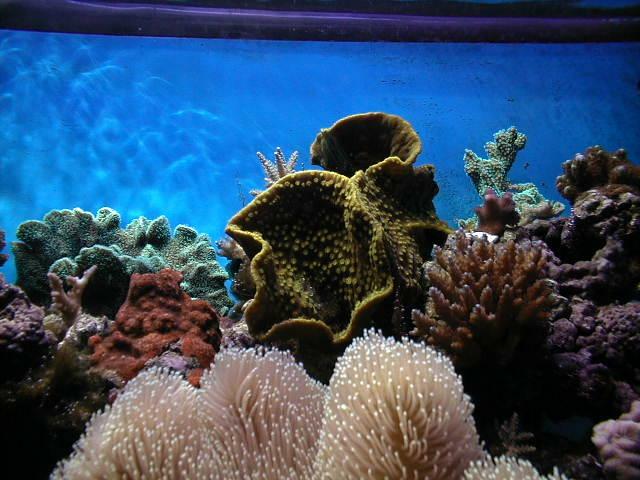 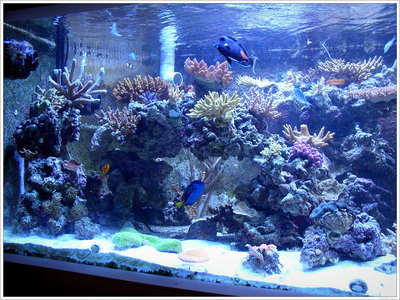 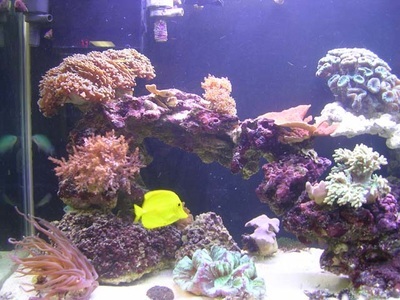 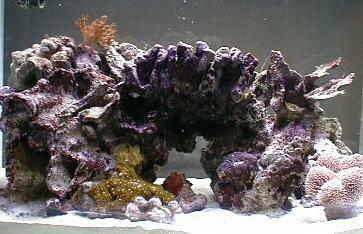 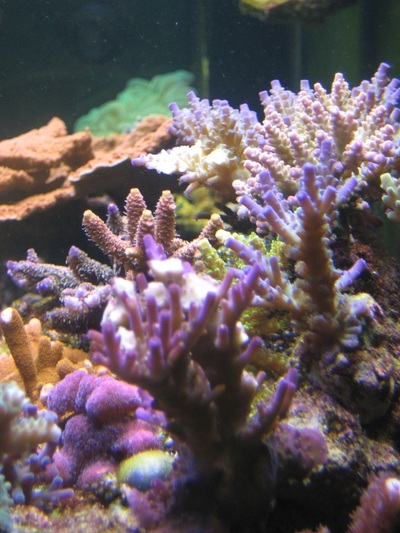 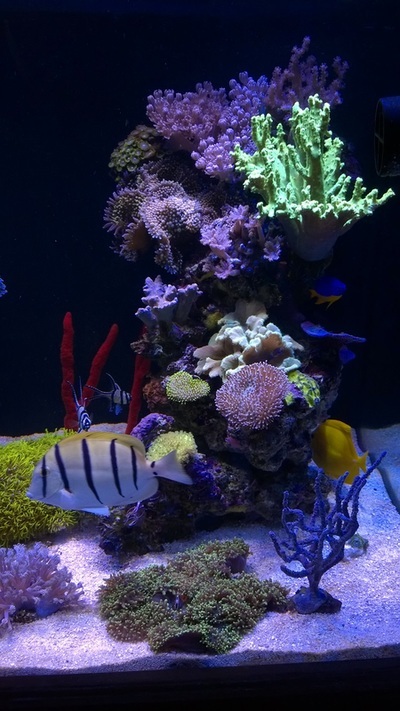 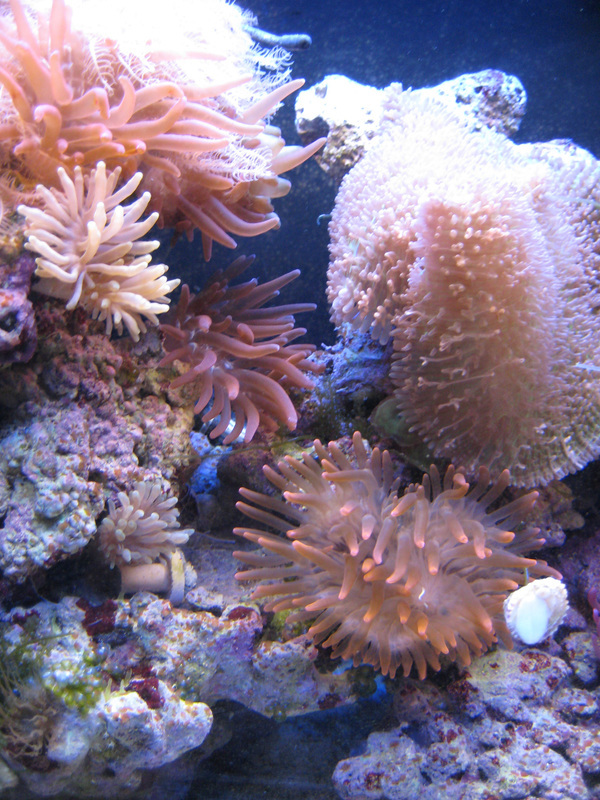 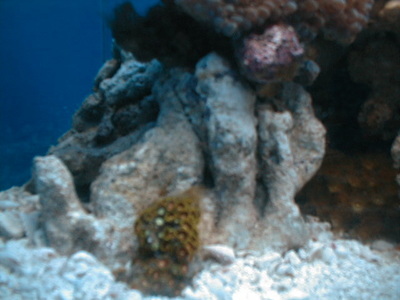 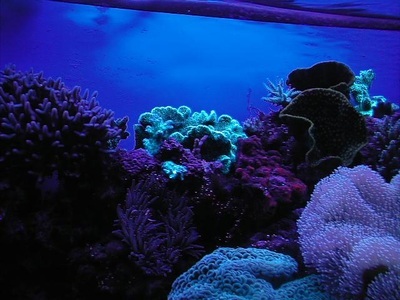 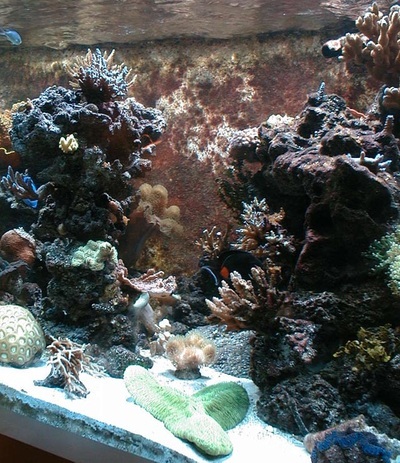 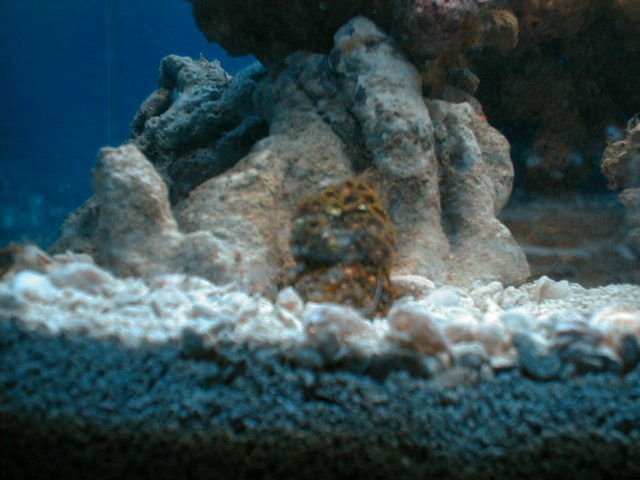 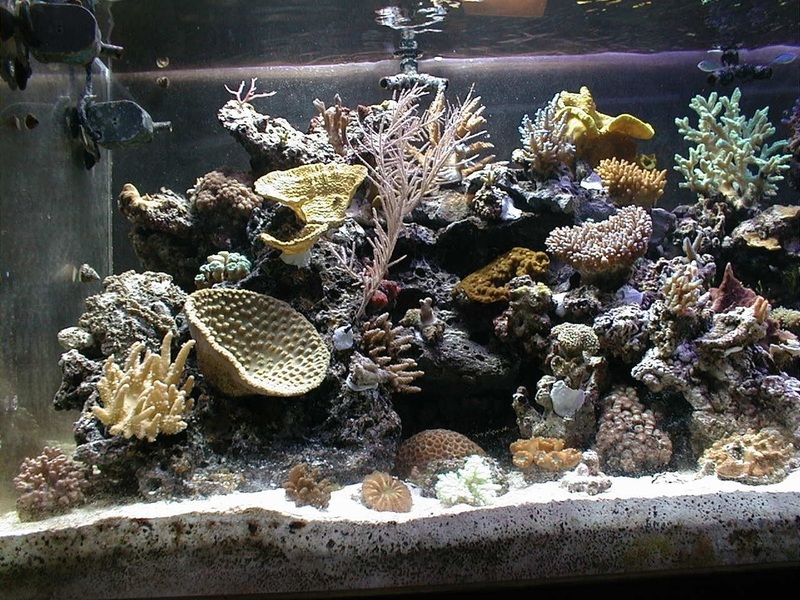 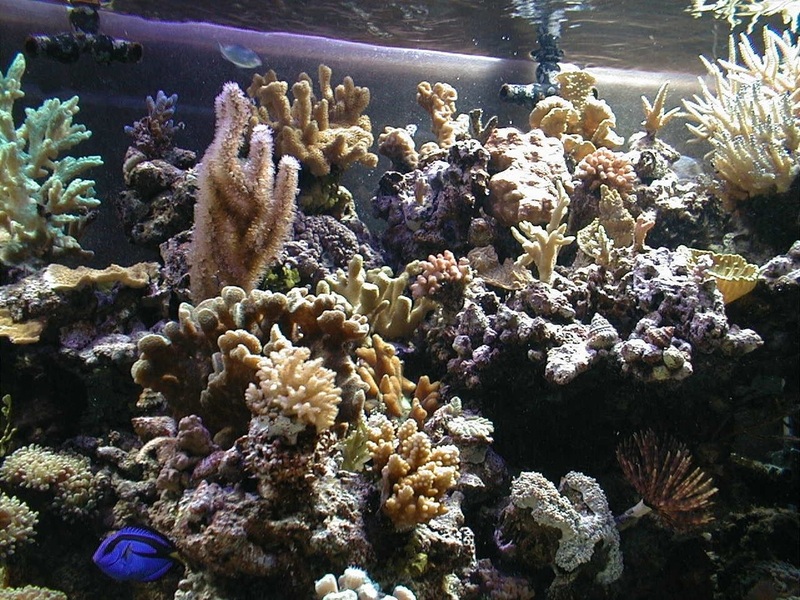 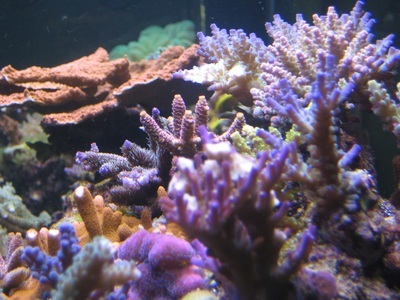 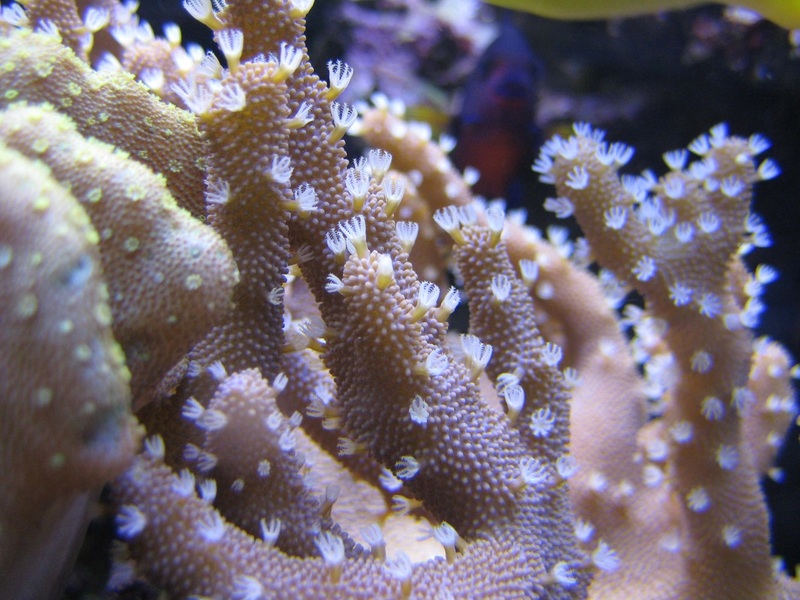 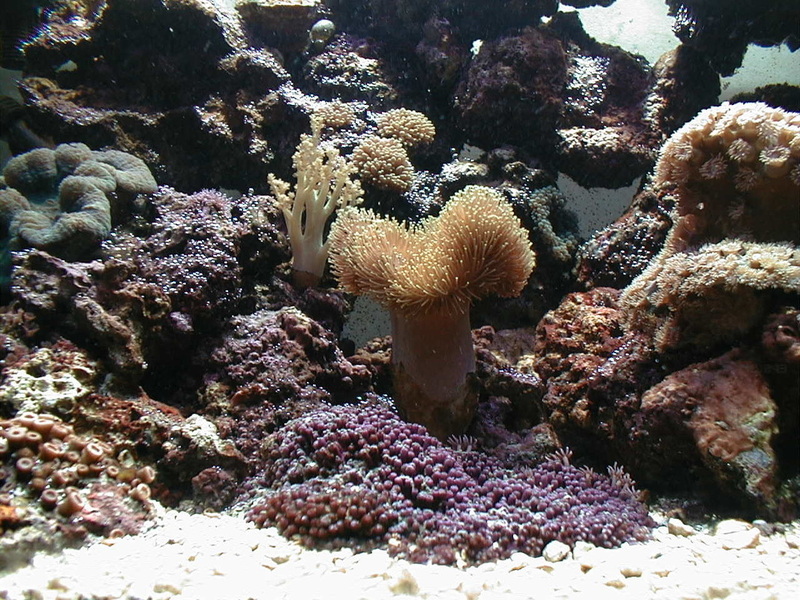 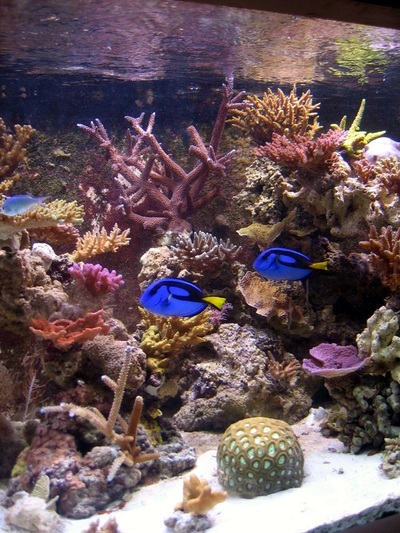 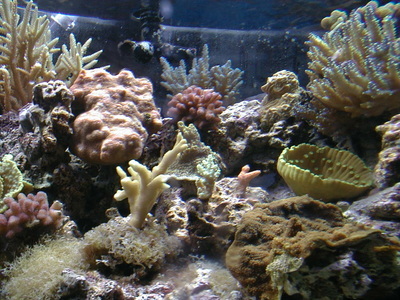 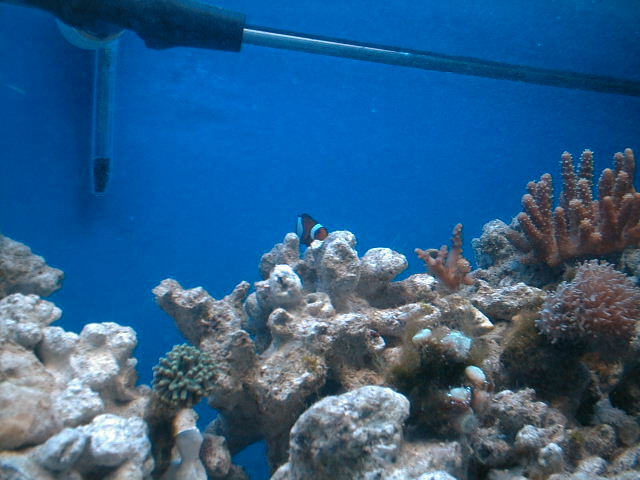 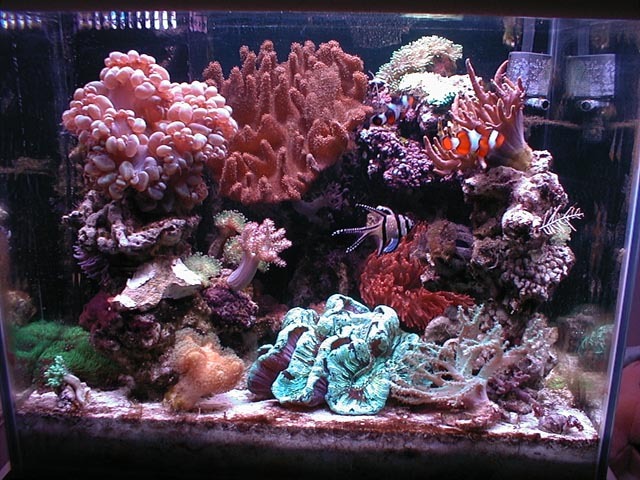 Just LPS and soft corals. 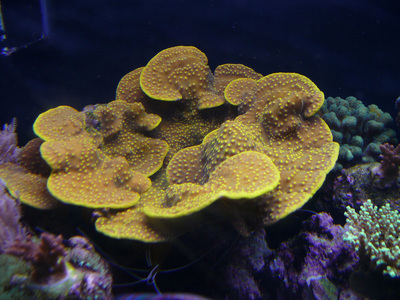 Well, it didn't work out so well, just can't stay completely away from SPS. It was my first ever bare bottom tank. 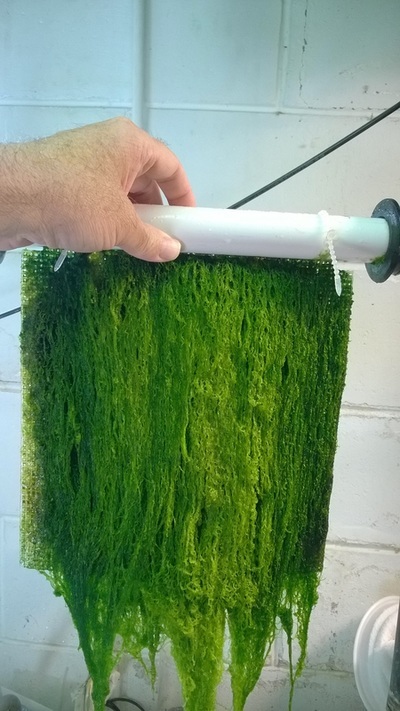 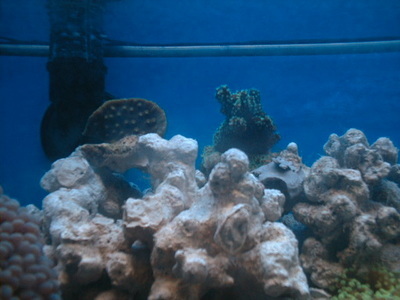 It was also a precursor to the aquascaping that I went with for the current 180g tank. 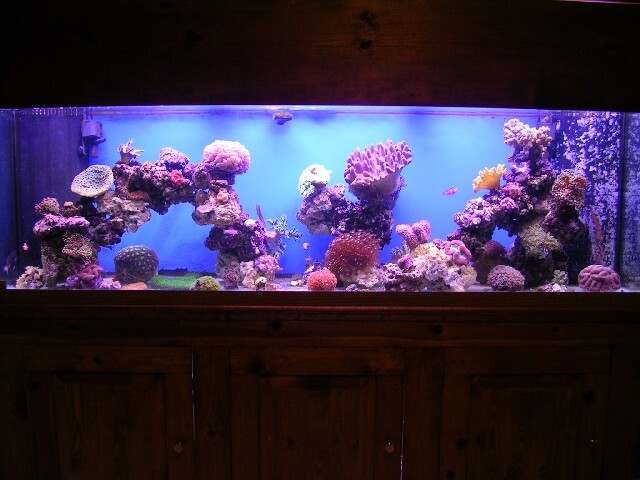 The structure got refined with the 110g tank. 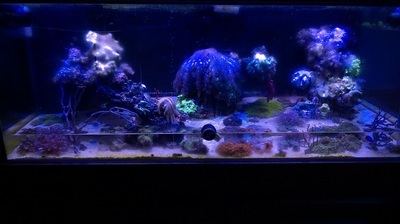 I never really liked this tank. I bought it used and the stand and canopy was pretty crappy. This lasted about a year before I setup purchased the 110g tank setup that had a really nice stand & canopy from Ryan B ( co-founder of BulkReefSupply ) and moved the stuff over. 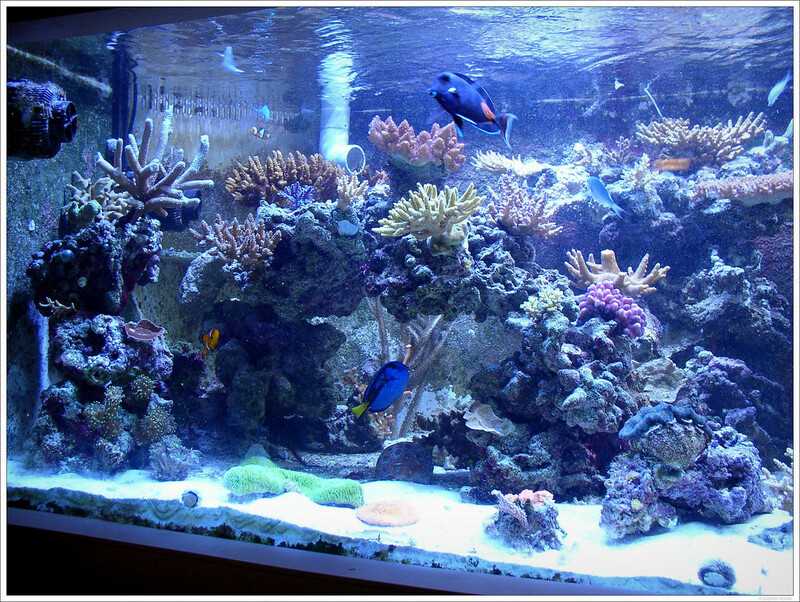 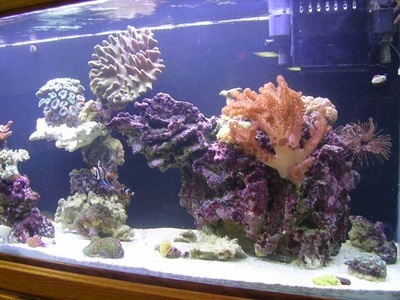 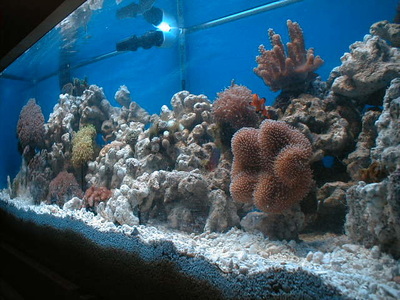 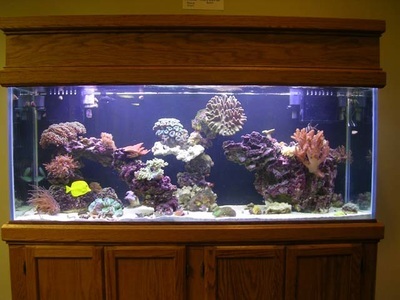 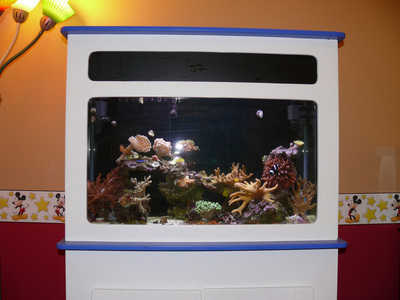 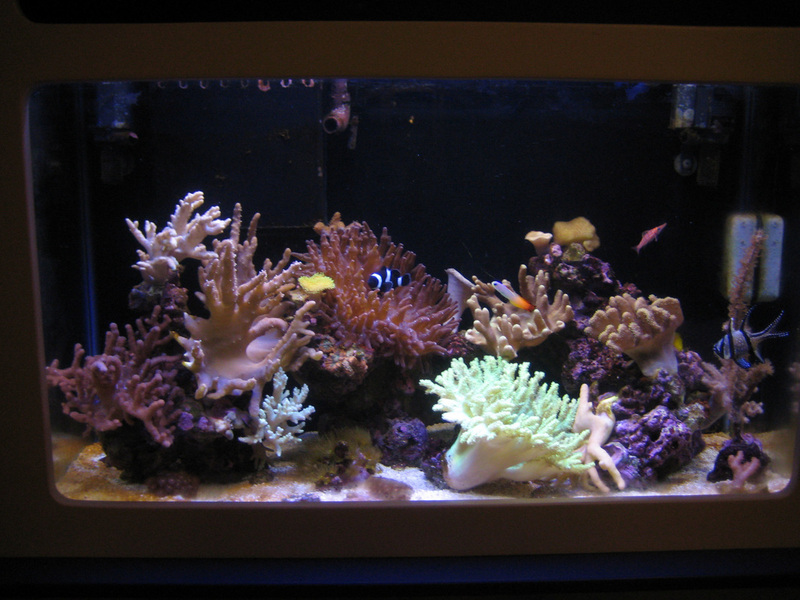 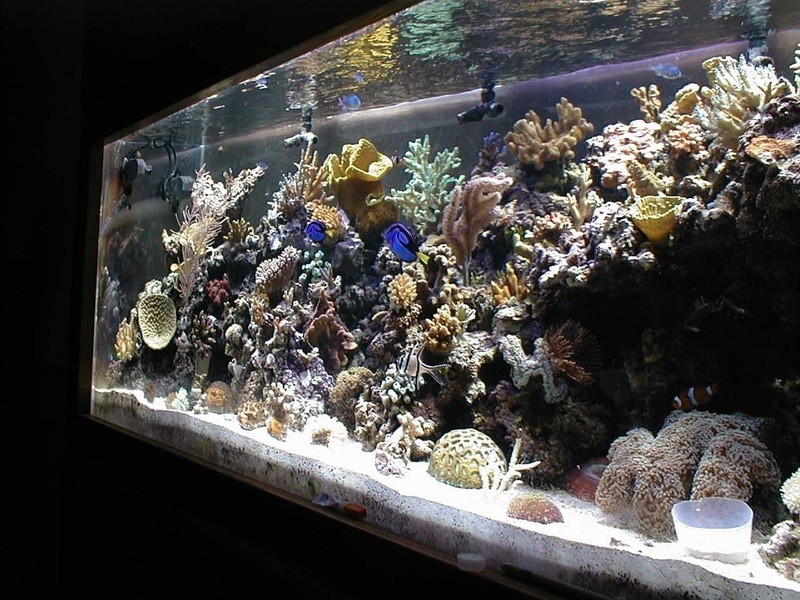 72g BowFront / 110g Tank ( 2003-2006 ) Living Waters Christian Church. 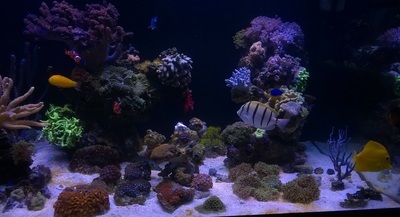 Started out as a 72g bowfront. I haven't found any pictures of that tank. 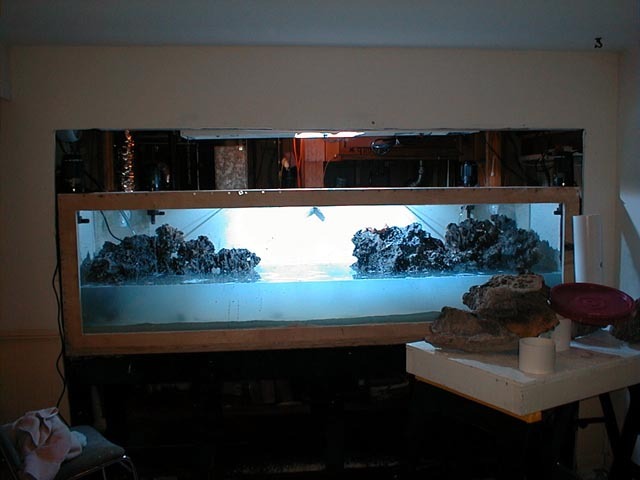 Later we moved all the livestock into a 110g tank. 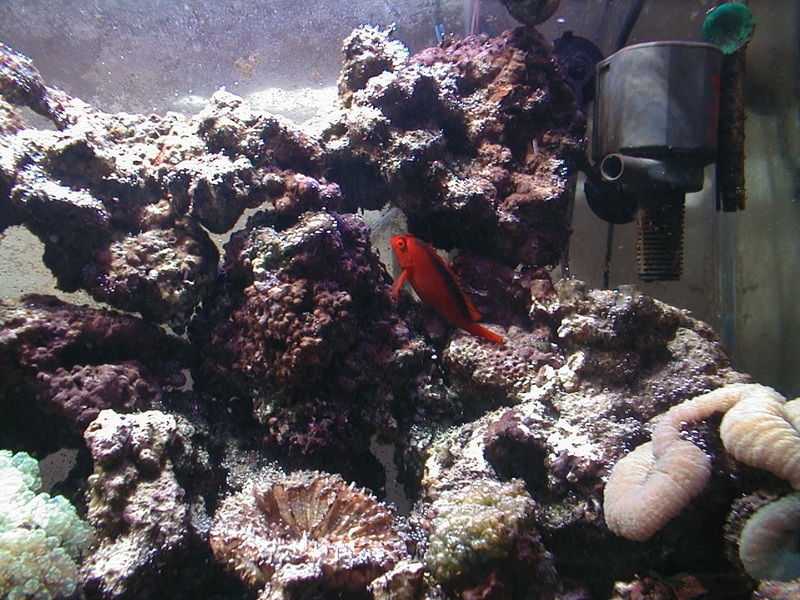 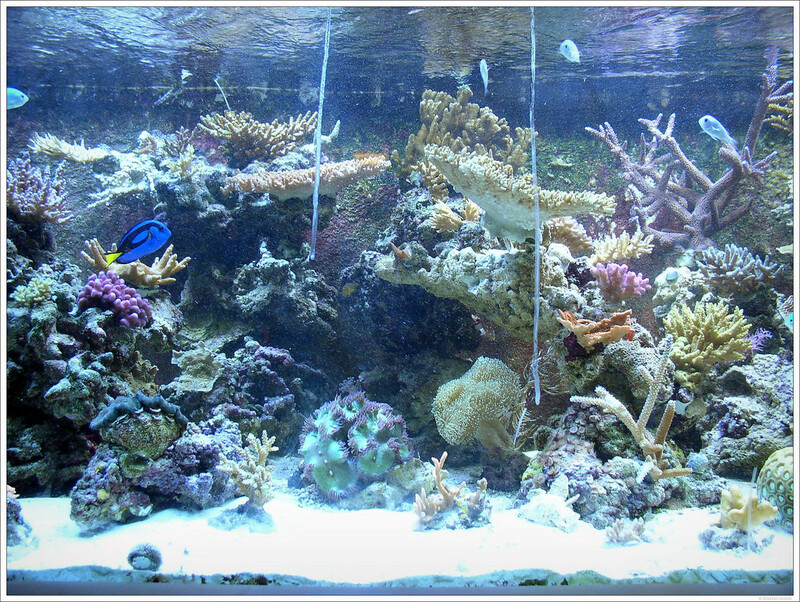 Some of the corals and fish were donated by TCMAS members, most of it though was surplus from my tanks. A coral beauty and flame angel were donated becuase they previous owners were convinced they were nipping and killing corals. 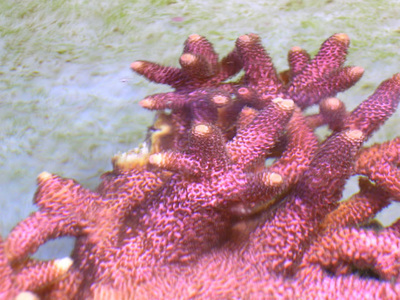 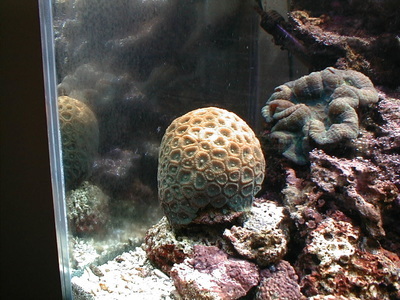 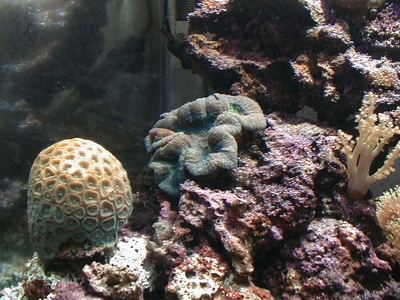 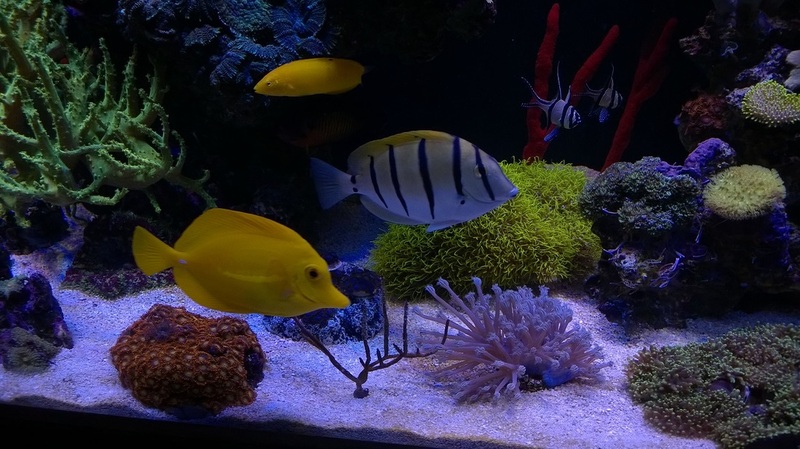 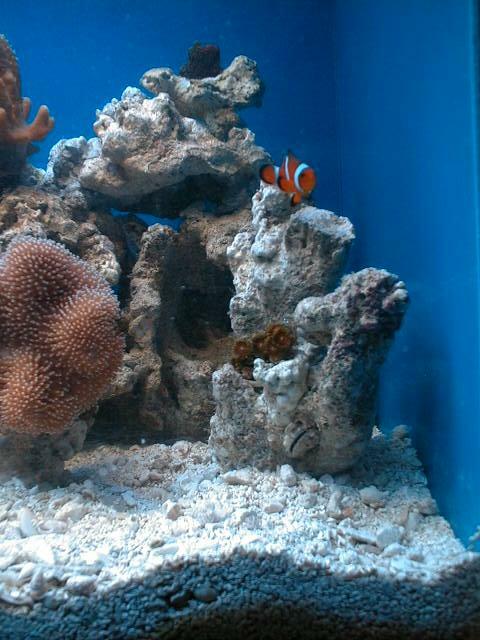 They were model citizens and coral beauty I kept for about 12 years before it died. 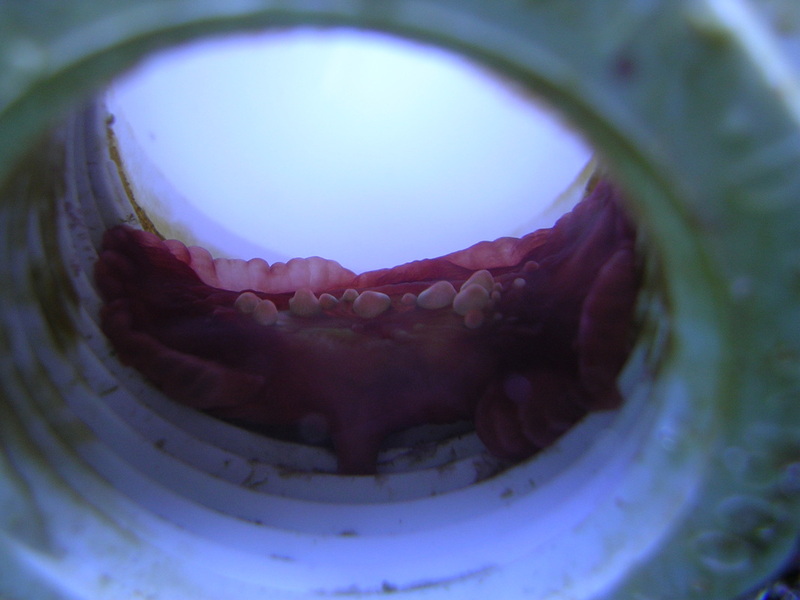 The 72g bow front had a really nice large colony of xenia in it. But it started to dwindle. 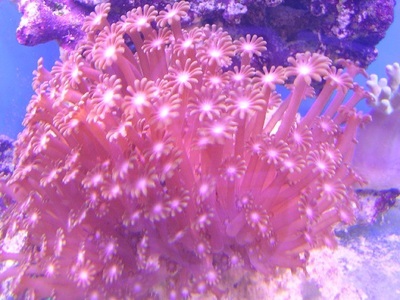 Never was able to keep xenia in this system again. I tried to reseed some several times and would never take. 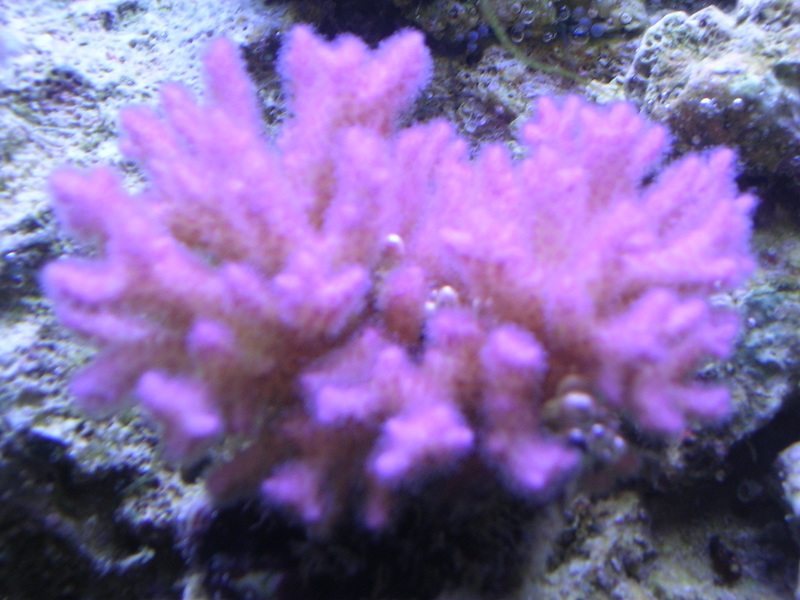 I assume that there must have been some nutrient or element that was depleted. Never able to pinpoint it. 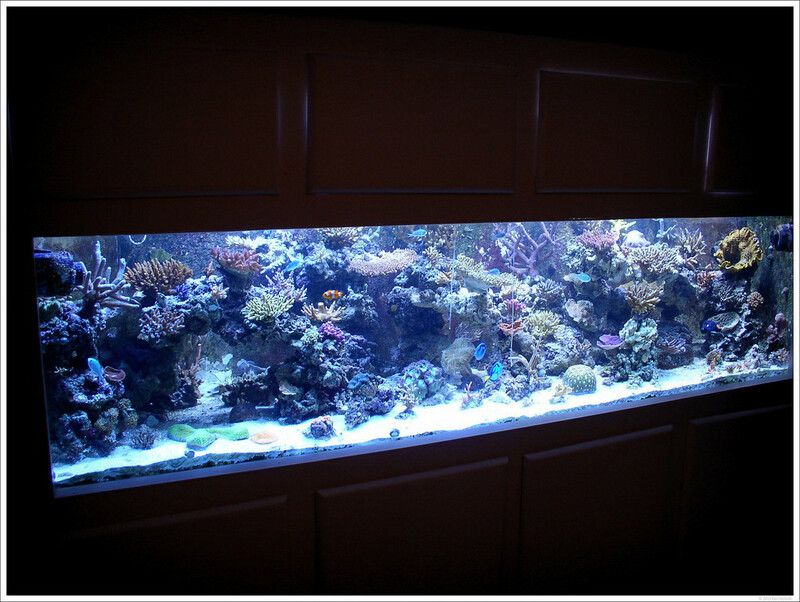 While this tank didn't have fancy corals in it or anything, it was one of the nicest tanks I have had. 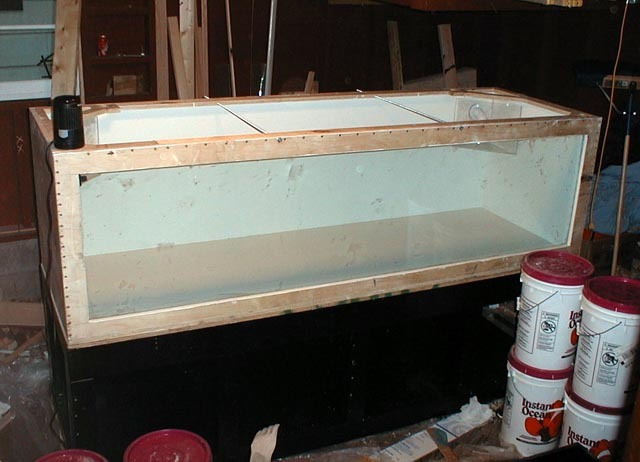 I think the reason was becuase we were there for church every Wed and Sunday and I had a set routine that I did and never put it off etc. 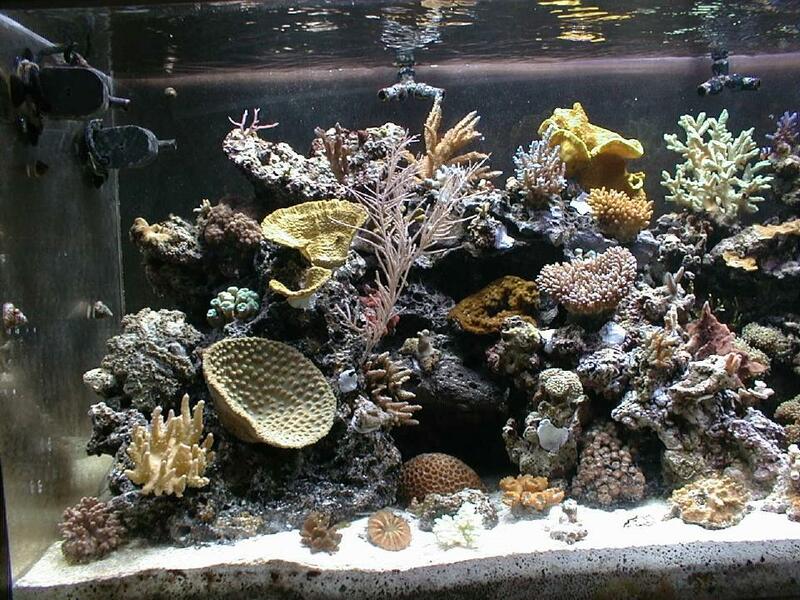 Kids would crowd around every Sunday trying to find the crabs and shrimp. 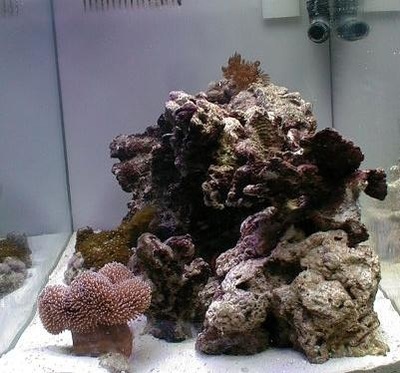 They really could care less about the corals. When the church disbanded, I liked the stand/canopy so much that I swapped out the 125g that I had with this one. I haven't found any full tank pics yet. 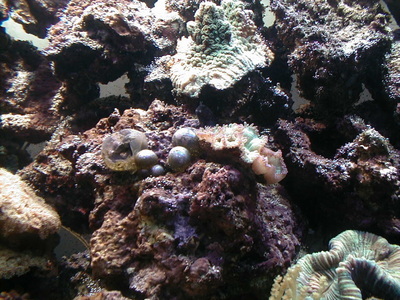 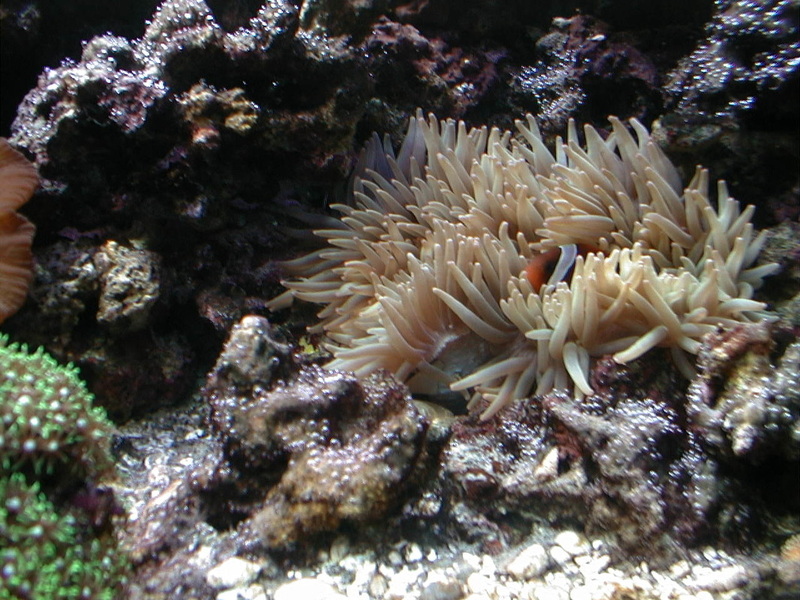 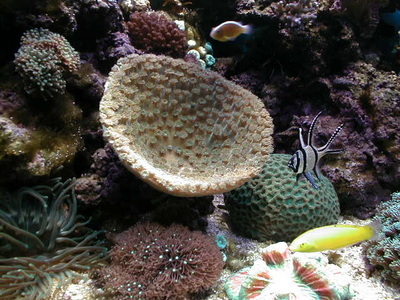 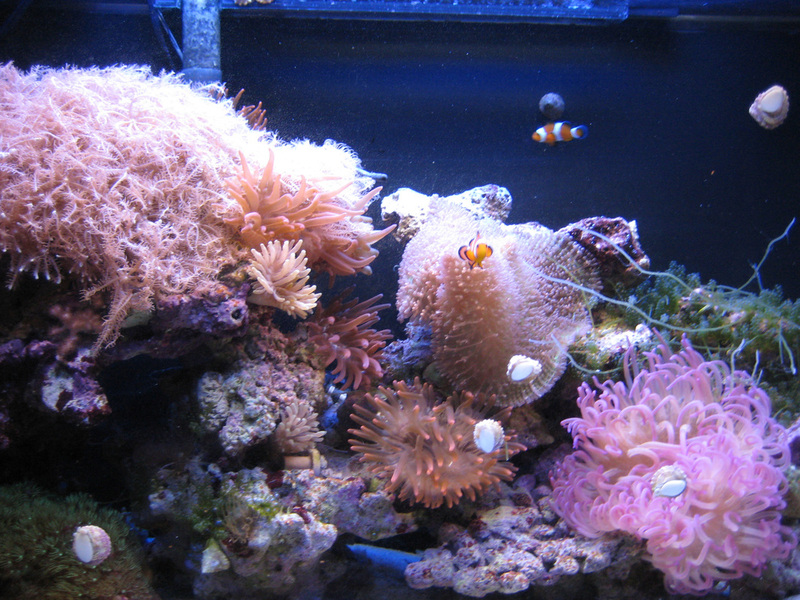 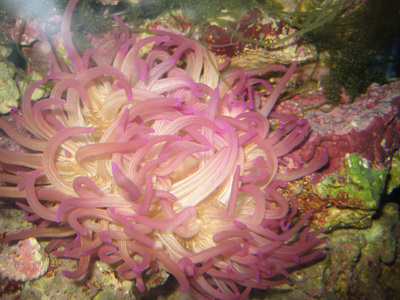 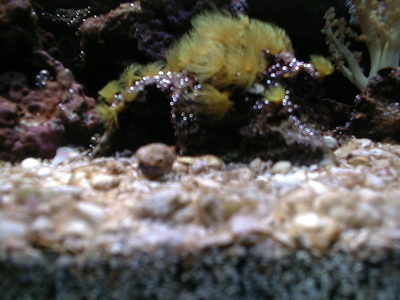 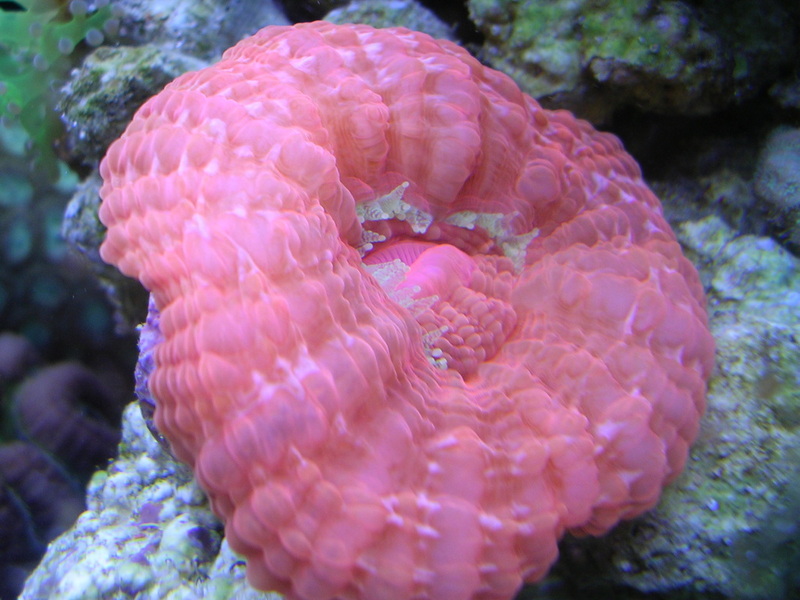 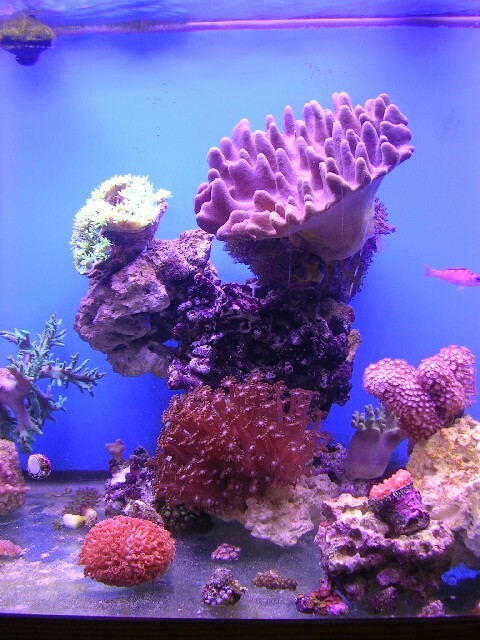 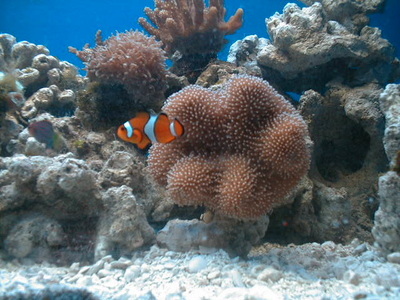 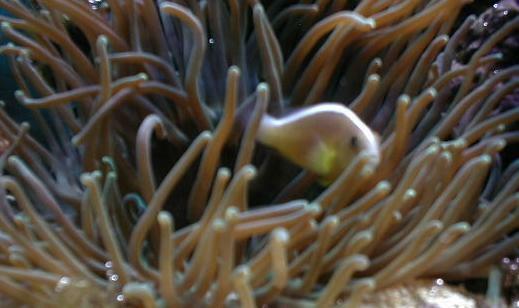 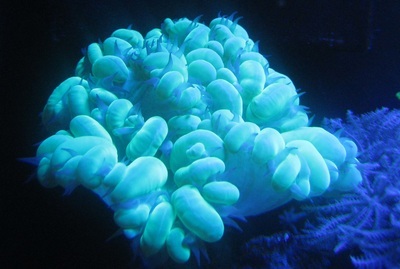 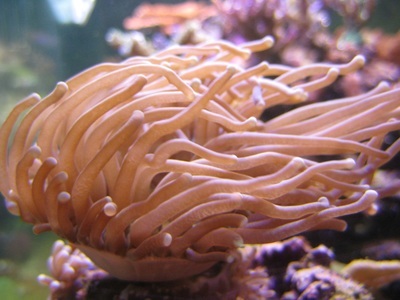 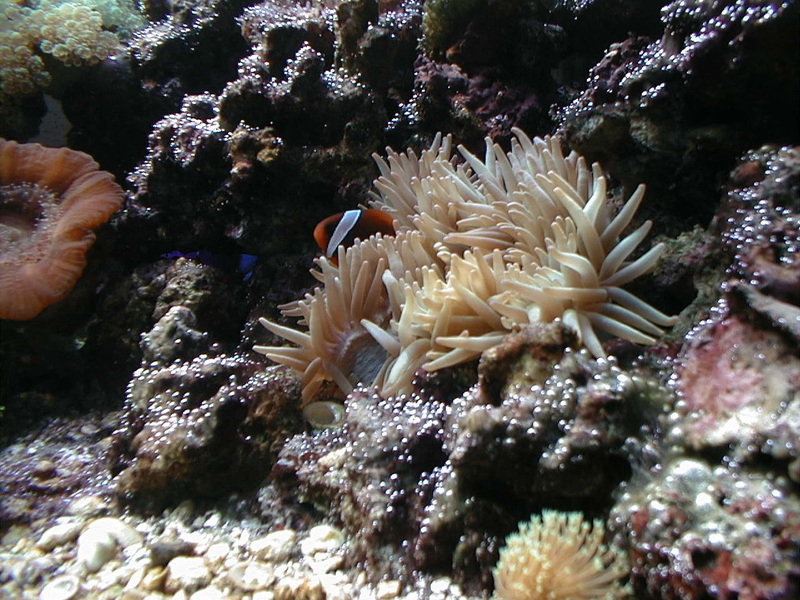 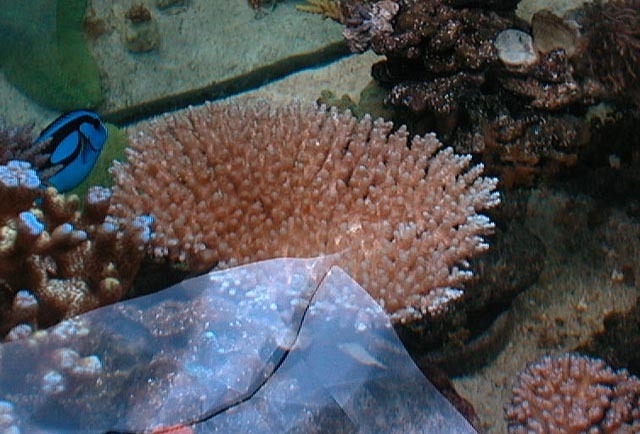 At one time, I had 17 bubble tip anemones in the tank. Most where rose bubbles some where green ones. Clownfish were finally starting to spawn but when drilling a hole in the ceiling nearby to hang a hook some drywall residue got in the tank. 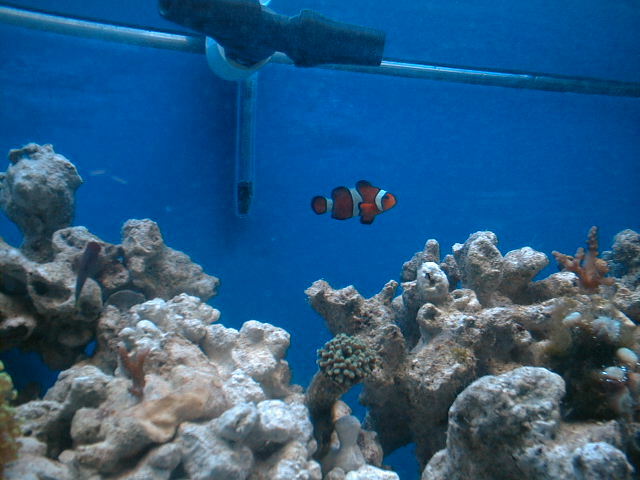 All the fish were dead the next morning. 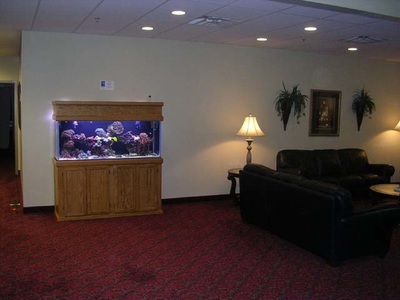 That's the only thing I could think of that may have caused it. 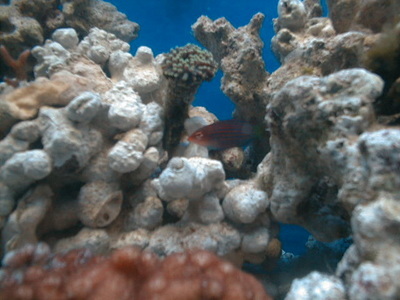 Corals were fine just killed the fish. 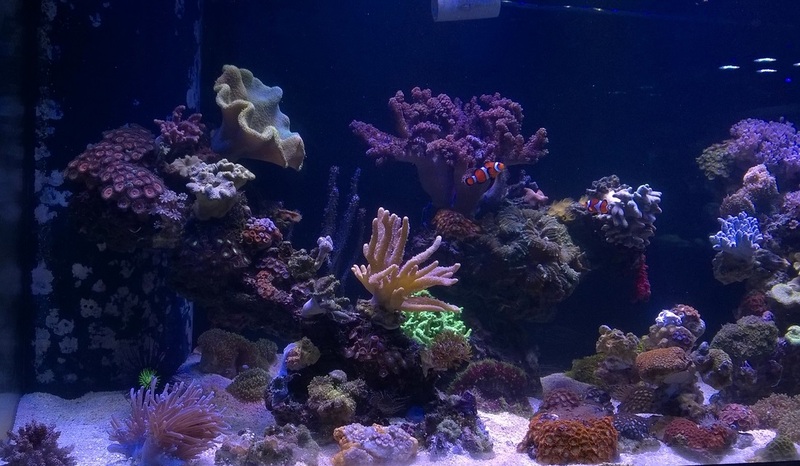 Started out as a 75g and later upgraded to a 120g. 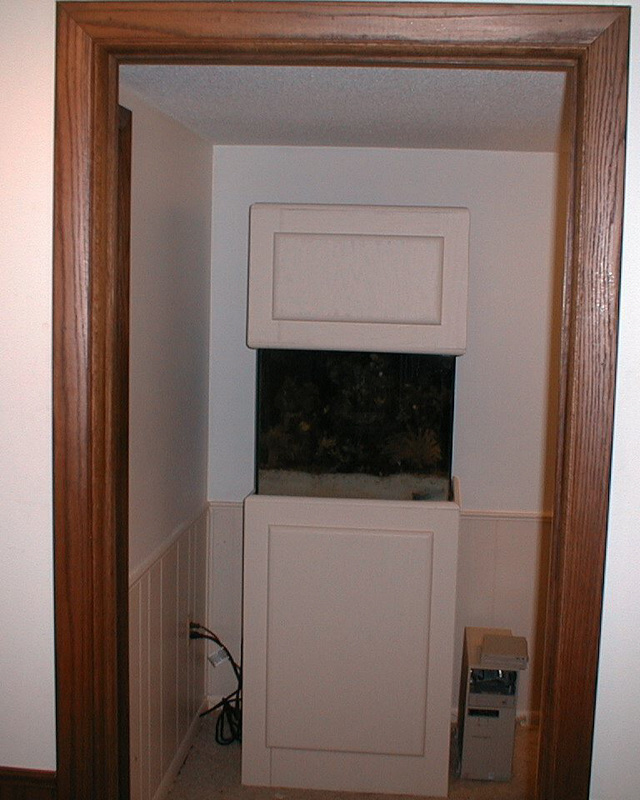 This one had ATS from the very beginning. 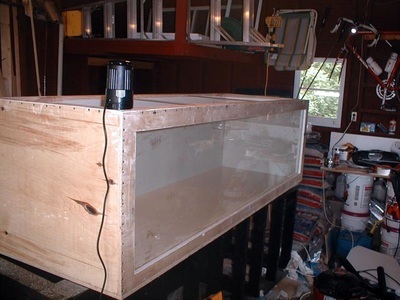 It built it as a ATS/sump combo. 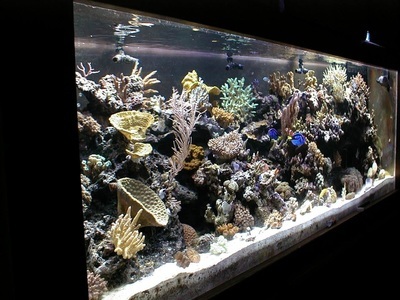 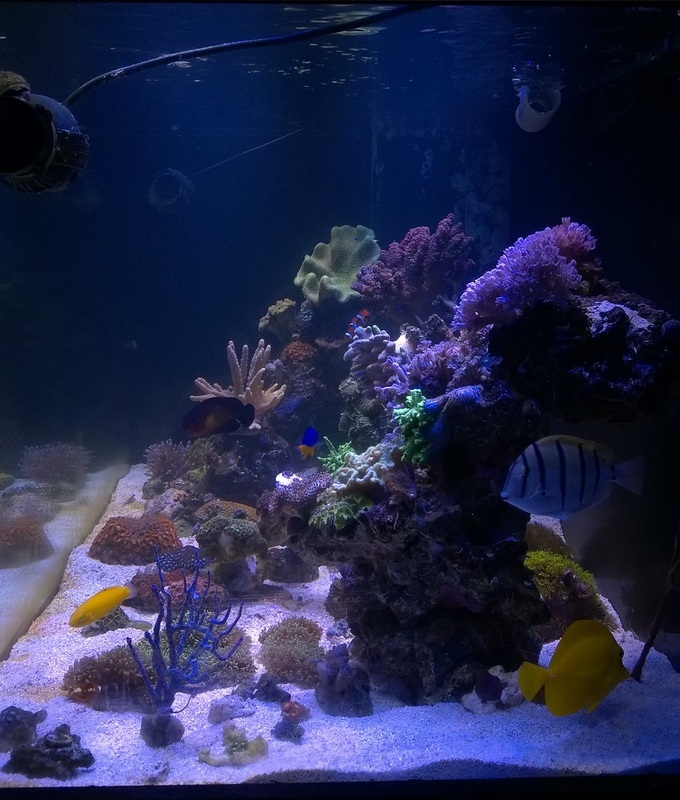 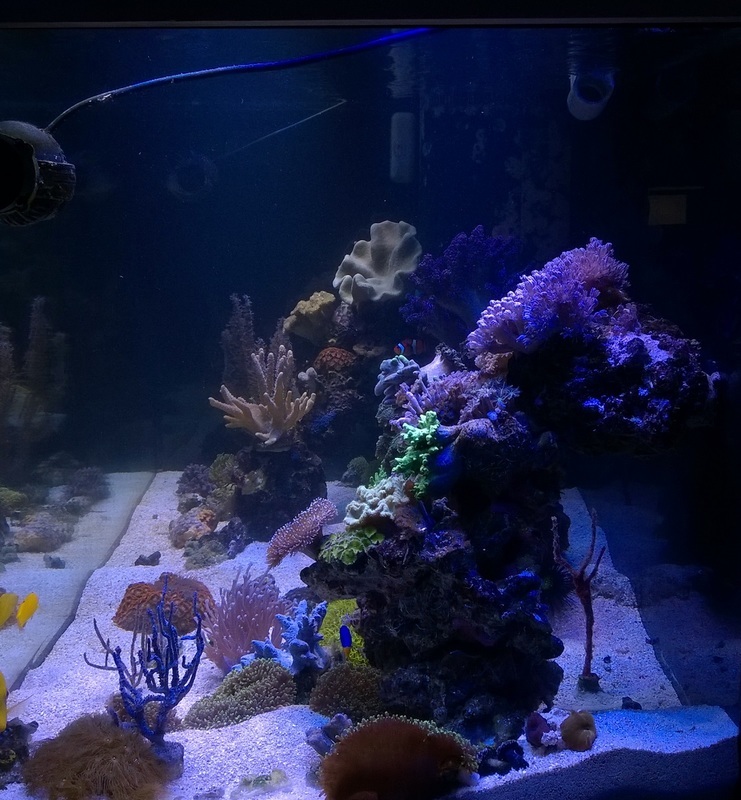 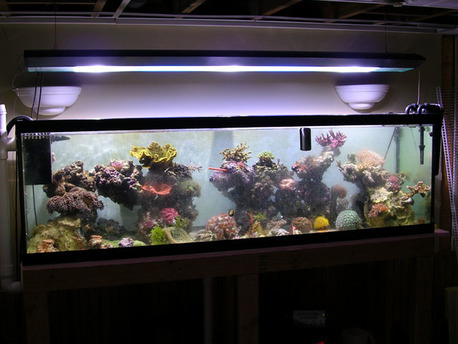 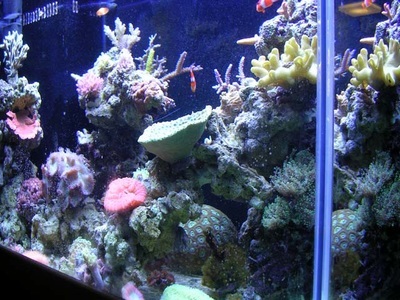 I used a reefbreeder photon 48" on it when upgraded to 120g I added a second reefbreeder photon 32" to help with front to back coverage. Overall I was happy with the lights. 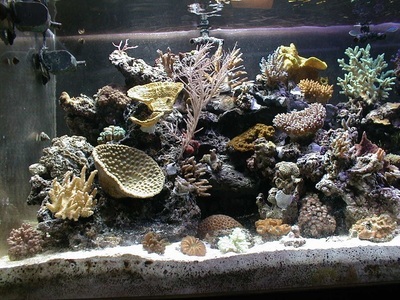 This tank never got fresh saltwater changes. When I would do a water change in the 180g tank I would recycle that water into the 120g tank. Had a lot of fun with this tank. 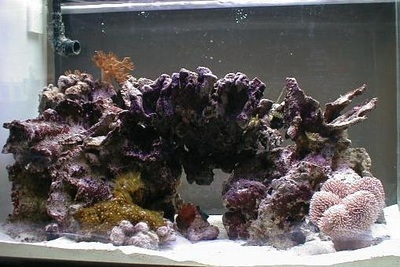 Only reason for getting rid of it was to simplify and get down to just 1 system.